Anyone who has ever been to the Prescott Hill Climb, on the north western slopes of the Cotswolds, just outside the village of Gotherington, in Gloucestershire would doubtless tell you that there is something almost quintessentially English about the site, and the setting. There has been hill climbing taking place at the site since 1938, and even though it is home to the Bugatti Owners Club – a French marque, of course – it retains that air which could probably never be created anywhere else in the world. And so, you might think that hosting an event here with a decidedly American theme to it could seem somewhat incongruous, and yet the Autumn Classic, a finale to the season, has done just that for several years now. 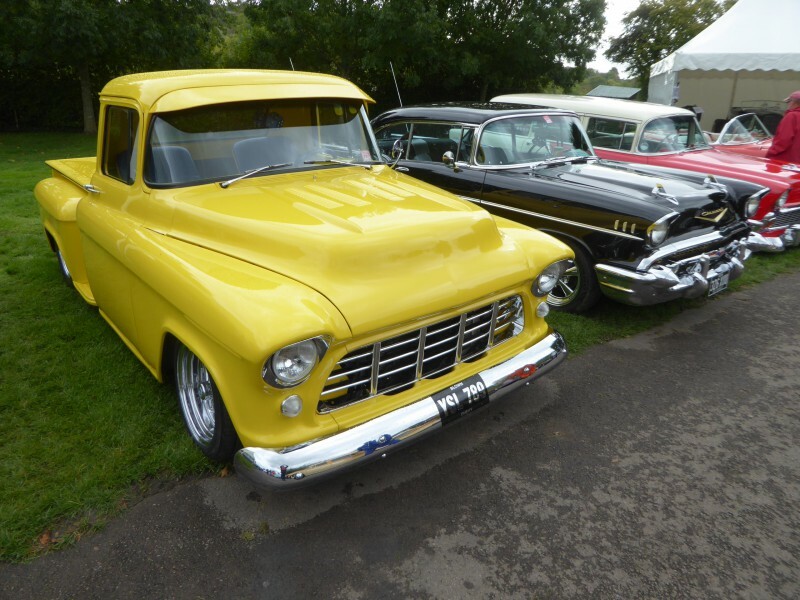 And every year, it seems to grow, with new Paddock displays of American cars and bikes, more and more people bringing along their own treasured American cars to augment the displays, with everyone revelling in all things “Uncle Sam”. All the pre-event publicity for the 2017 event suggested it would be the biggest and best yet. Of course, there is one variable which no amount of planning can do anything about, and that is the weather. By early October, you can experience the last days of an Indian Summer, or you can be trying to avoid wallowing in the deepest areas of mud across the site, and over the years, this event has experienced both of these extremes. There was not deep mud in 2017, fortunately, though the ground was quite soft underfoot, and a day of drizzly rain did little to help matters. Sadly, it also deterred quite a lot of the general public, I think, and there were fewer people to enjoy a great day out than all the hard work that gone into the planning of this event deserved. Here’s what I was able to see on the Saturday, the first of two days of the Autumn Classic. To reinforce the American theme, special display areas are reserved both for the Paddock and a sizeable area of the Orchard, for American cars. 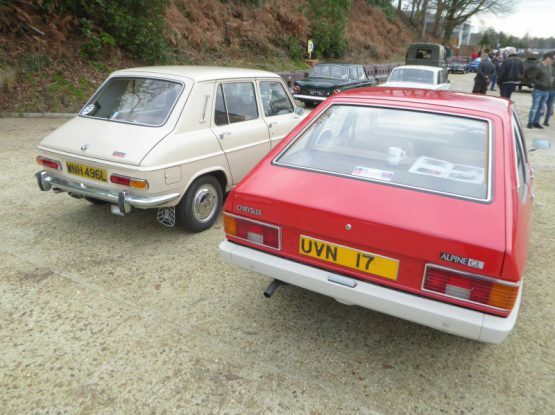 Both were well populated, with quite a variety of different models, of all ages from pre-war to much more recent. Although few American cars have been sold new in the UK over the years, there are more here than you might think, and an event like this proves the point. Some were cars which I have seen here before, but there were plenty that I have not . As well as providing a wonderful static display during the morning and afternoon, many of the cars formed a splendid cavalcade up the hill at lunchtime. Although many will remind you that AC is a British marque, the legendary Cobra owes it existence to Carroll Shelby, who most definitely was American, so the examples of this car – all of them replica models – clearly belonged in the display here. The Shelby Daytona Coupe (also referred to as the Shelby Daytona Cobra Coupe) is an American sports-coupé related to the AC Cobra roadster, loosely based on its chassis and drive-train. It was built for auto racing, specifically to take on Ferrari and its 250 GTO in the GT class. Just six Shelby Daytona Coupes were built between 1964 and 1965, as Shelby was reassigned to the Ford GT40 project to compete at the 24 hours of Le Mans, again to beat Ferrari in the highest level prototype class. With the Shelby Daytona, Shelby became the first American constructor to win a title on the international scene at the FIA World Sportscar Championship in 1965. Whilst 5 of those originals were gathered together at the 2015 Goodwood Festival of Speed, neither of the two on site here were from the extremely valuable original production. Both were replicas, of which a reasonable number have been produced over the years, as there are plenty of people who love this car and want to own one but cannot afford the millions charged for an original on the rare occasions that one comes up for sale. This splendid period piece, so redolent of the mid 1950s is a 1956 Buick Century. Buick used the Century name for a series of cars from 1936 to 1942, again from 1954 to 1958, and for a third time from 1973 to 2005 for a series of generations of their mid-size car. The model name Century came about when Buick was designing its first production automobile capable of reaching a speed of 100 mph. The division needed to come up with a name. One of the Buick executives had returned from a recent trip to the UK and on his return he told the other executives that the British referred to going at 100 mph as “doing the century”. The executives liked the Century name and it stuck. The first Century was introduced in 1936, a new name for the Series 60 which sat in the middle of the product range. The name would be reintroduced for 1954, using the same formula as before of mating the smaller, lighter Buick Special body to its largest and most powerful 322 cubic inch V8 engine with the intent of giving Buick a performance vehicle. Included in the model lineup during this period was a station wagon model, a body style that had been unavailable during the Century’s first production period of 1936 to 1942. Introduced in the middle of the 1955 model year the 4-door Buick Century Riviera along with the 4-door Special Riviera and the 4-door Oldsmobile 98 Holiday and 4-door 88 Holiday, were the first 4-door hardtops ever produced. This was the first time “VentiPorts” appeared on the Century, a carryover from the Buick Roadmaster. In 1955, the California Highway Patrol placed a large fleet order for Century 2-door sedans, a body style unavailable to the general public. It combined the Special 2-door sedan body shell with Century powertrain and trim. Broderick Crawford was shown driving a 2-door Century sedan during the first season of his popular syndicated TV series “Highway Patrol”. The Century remained Buick’s performance line, with engine power rising from 200 (SAE gross) in 1954, to 236 in 1955, to 255 in 1956, and topping out at 300 from a bored-out 364 cu in (6.0 litre) engine in 1957-58, the last model years for the full sized Century line before the model was restyled and renamed the Invicta. This massive machine is a 1958 Cadillac Series 62. The Series 62 is a series of cars produced from 1940 through 1964. Originally designed to replace the entry level Series 65, it became the Cadillac Series 6200 in 1959, and remained that until it was renamed to Cadillac Calais for the 1965 model year. The Series 62 was also marketed as the Sixty-Two and the Series Sixty-Two. By the time of the 1958 cars, Cadillac was on the fifth generation of Series 62 cars. these had been introduced in 1957, and would run for just 2 years. For 1957, a tubular X-frame without side rails was adopted. This resulted in lower body without a loss of usable space. Front end styling was marked by rubber bumper guard tips and dual circular lamps set into the lower bumper section. Side trim was revised and a dual taillight theme was used. Identifying the standard 62 models were bright metal mouldings, just forward of the rear wheel openings, highlighted by seven horizontal wind slits. At the upper end this fender brake trim joined a horizontal moulding that ran along a conical flare extending towards both taillamps. A crest medallion was seen on the forward angled rear fins. De Villes had special nameplates on the front fenders. Series 62 Eldorados (as distinct from the Series 70 Eldorado Brougham) were further distinguished by the model name above a V-shaped rear deck ornament and on the front fenders. The rear fender and deck contour was trimmed with broad, sculptured stainless steel beauty panels. Also seen were “shark” style fins pointing towards the back of the cars. A three section built in front bumper was another exclusive trait of the Series 62 Eldorados, which came with a long list of standard features. A new body style was added to the sub-series, a 4-door Eldorado Sedan Seville, but only four were actually sold, and it was cancelled the following year. For 1958, there was a new grille featuring multiple round “cleats” at the intersection of the horizontal and vertical members. The grille insert was wider and new bumper guards were positioned lower to the parking lamps. New dual headlamps were used and small chrome fins decorated the front fenders. Tailfins were less pronounced and trim attachments were revised. The word Cadillac appeared in block letters on the fins of base models. On the sides of the car were five longer horizontal wind splits ahead of the unskirted rear wheel housing and front fender horizontal mouldings with crests placed above the trailing edge and no rocker sill trim. The convertible and the De Villes used solid metal trim on the lower half of the conical projection flares, while other models had a thin ridge moulding in the same location. On Series 62 Eldorados, a V-shaped ornament and model identification script were mounted to the deck lid. Series 62 Eldorados also had ten vertical chevron slashes ahead of the open rear wheel housings and crest medallions on the flank of the tailfins. Broad, sculptured beauty panels decorated the lower rear quarters on all Series 62 Eldorados and extended around the wheel opening to stretch along the body sills. Standard equipment on all Series 62s was the same as the previous year. All new was an extended deck Series 62 sedan which, along with the Series 62 Sedan deVille, stretched 8.5 inches longer than the regular 4-door Series 62, and a special order Series 62 Eldorado Seville of which only one was actually built. Excluding export sedans and chassis only, the Series 62 offered an all-time record of nine bodystyles this year. The infamous Cadillac Air-Suspension was optional. The following year De Ville and Eldorado were spun off onto their own series. Showing the evolution of Cadillac styling was this 1962 Sedan de Ville. Cadillac had restyled and re-engineered their cars for 1961. The new grille slanted back towards both the bumper and the hood lip, along the horizontal plane, and sat between dual headlamps. New forward slanting front pillars with non-wraparound windshield glass were seen. The revised backlight treatment had crisp angular lines with thin pillars on some models and heavier semi-blind quarter roof posts on others. DeVille models featured front series designation scripts and a lower body “skeg” trimmed with a thin, three-quarter-length spear molding running from behind the front wheel opening to the rear of the car. Standard equipment included power brakes, power steering, automatic transmission, dual backup lights, windshield washer, dual speed wipers, wheel discs, plain fender skirts, outside rearview mirror, vanity mirror, oil filter, power windows and 2-way power seats. Rubberised front and rear coil springs replaced the trouble prone air suspension system. Four-barrel induction systems were now the sole power choice and dual exhaust were no longer available. A new short-decked four-door Town Sedan hardtop appeared mid-season. A mild facelift characterised Cadillac styling trends for 1962. A flatter grille with a thicker horizontal center bar and more delicate cross-hatched insert appeared. Ribbed chrome trim panel, seen ahead of the front wheel housings in 1961, were now replaced with cornering lamps and front fender model and series identification badges were eliminated. More massive front bumper end pieces appeared and housed rectangular parking lamps. At the rear tail lamps were now housed in vertical nacelles designed with an angled peak at the centre. A vertically ribbed rear beauty panel appeared on the deck lid latch panel. Cadillac script also appeared on the lower left side of the radiator grille. The short-deck hardtop Town Sedan was moved from the DeVille series to the Series 6200, being replaced by a short-deck Park Avenue. In addition all short deck Cadillac models went from being 6-window sedans in 1961 to 4-window sedans in 1962 and 1963. Standard equipment included all of last year’s equipment plus remote controlled outside rearview mirror, five tubeless black wall tires, heater and defroster and front cornering lamps. Cadillac refined the ride and quietness, with more insulation in the floor and behind the firewall. DeVille sales as a separate series exceeded their sales level as a trim level for the first time ever at 71,883 units, or nearly 45% of Cadillac’s total sales. In overall terms 1963 Cadillac was essentially the same as the previous year. Exterior changes imparted a bolder and longer look. Hoods and deck lids were redesigned. The front fenders projected 4.625 inches further forward than in 1962 while the tailfins were trimmed down somewhat to provide a lower profile. Body-side sculpturing was entirely eliminated. The slightly V-shaped radiator grille was taller and now incorporated outer extensions that swept below the flush-fender dual headlamps. Smaller circular front parking lamps were mounted in those extensions. A DeVille signature script was incorporated above the lower beltline moulding near the rear of the body. A total of 143 options including bucket seats with wool, leather, or nylon upholstery fabrics and wood veneer facings on dash, doors, and seatbacks, set an all-time record for interior appointment choices. Standard equipment was the same as the previous year. The engine was entirely changed, though the displacement and output remained the same, 390 cu in (6.4 litre) and 325 hp. It was time for another facelift in 1964 and really a minor one. New up front was a bi-angular grille that formed a V-shape along both its vertical and horizontal planes. The main horizontal grille bar was now carried around the body sides. Outer grille extension panels again housed the parking and cornering lamps. It was the 17th consecutive year for the Cadillac tailfins with a new fine-blade design carrying on the tradition. Performance improvements including a larger V-8 were the dominant changes for the model run. Equipment features were same as in 1963 for the most part. Comfort Control, a completely automatic heating and air conditioning system controlled by a dial thermostat on the instrument panel, was introduced as an industry first. The engine was bumped to 429 cu in (7 litre), with 340 hp available. Performance gains from the new engine showed best in the lower range, at 20 to 50 mph traffic driving speeds. A new technical feature was the Turbo-Hydramatic transmission, also used in the Eldorado and the Sixty Special. A DeVille script above the lower belt moulding was continued as an identifier. This was the first year for the DeVille convertible. DeVille sales reached 110,379 units, accounting for nearly two thirds of all Cadillacs sold. Final Cadillac here was a 1976 Coupe de Ville, from the last generation before the cars got a bit smaller. This body style was produced from 1971 through to 1976. With 64.3 inches front shoulder room (62.1 inches on Cadillac) and 63.4 inches rear shoulder room (64.0 inches on Cadillac) the new for 1971 full-sized GM cars set a record for interior width that would not be matched by any car until the full-size GM rear-wheel-drive models of the early to mid-1990s. The styling of the new Cadillacs bore a strong resemblance to the models they replaced, but there were differences. Pairs of individually housed squarish headlamps were set wider apart. The V-shaped grille had an egg-crate style insert and was protected by massive vertical guards framing a rectangular license plate indentation. A wide bonnet with full-length windsplints, a prominent centre crease and hidden windshield wipers was seen. A Cadillac crest decorated the nose and new indicator lamps appeared atop each front fender. A horizontal beltline moulding ran from behind the front wheel housing, almost to the rear stopping where an elliptical bulge in the body came to a point and where thin rectangular side markers were placed above and below the chrome strip. The rear wheel openings were again housed in fender skirts. Tail lamps were of the same type as before but were no longer divided by a chrome bar. Long horizontal back-up lamps were set in the bumper, on either side of a deeply recessed license plate housing. De Villes were set apart visually by thin bright metal rocker panel steps and signature script on the front fenders bearing the series name. The bottoms of the rear fenders were decorated with a bright metal beauty panel that was wider than the rocker panel strips and blended into the moulding running along the bottom of the fender skirt. The standard engine remained the 472, still rated at 375 SAE gross hp and 365 lb/ft of torque. Detailed styling changes were made every year throughout the 5 year production run, with energy absorbing bumpers appearing in 1973, a year in which sales set a new record at 216,243. 1974 saw the introduction of the optional “Air Cushion Restraint System”. Known today as airbags, this option provided protection for front seat occupants in the case of a frontal collision. One bag was located in the steering wheel, the other in the dashboard in front of the front seat passenger. The glove box was replaced with a lockable storage compartment under the dashboard. The option was unpopular and was discontinued after the 1976 model year. Making another appearance at this event were a pair of Chaparral cars. Named after a fast-running ground cuckoo that is commonly known as a chaparral or a roadrunner, Chaparral Cars was an American racing team which was founded in 1962 by Formula One racer Hap Sharp and Jim Hall, a Texas oil magnate with both engineering and race car driving skills. Jim Hall raced the front-engined Chaparral (retroactively called the “Chaparral 1”) through 1962, bought from Troutman & Barnes (like the Scarab, the Chaparral 1 cars were built in California by Troutman & Barnes). Hall and Hap Sharp extensively modified their Chaparral, and eventually decided to build their own car. They obtained permission from Troutman & Barnes to use the Chaparral name, which is why all of Hall’s cars are called Chaparral 2s. The two cars on show here were Chaparral 2 models. The first Chaparral 2-Series was designed and built to compete in the United States Road Racing Championship and other sports car races of the time, particularly the West Coast pro Series races that were held each autumn. Hall had significant “under the table” assistance from GM, including engineering and technical support in the development of the car and its automatic transmission (this is evidenced by the similarity between the Chevy Corvette GS-II “research and development” car and the Chaparral 2A through 2C models). First raced in late 1963, the Chaparral 2 developed into a dominant car in the CanAm series in 1966 and 1967. Designed for the 200 mile races of the CanAm series, it was also a winner in longer endurance races. In 1965 it shocked the sportscar world by winning the 12 Hours of Sebring in a pouring rain storm, on one of the roughest tracks in North America. The Chaparral 2 featured the innovative use of fibre glass as a chassis material. The Chaparral 2C had a conventional aluminium chassis. It is very difficult to identify all iterations of the car as new ideas were being tested continually. The 2A is the car as originally raced, featuring a very conventional sharp edge to cut through the air. It also featured a concave tail reminiscent of the theories of Dr. Wunibald Kamm. The first aerodynamic appendages began to appear on the 2A almost immediately to cure an issue with the front end being very light at speed with a consequent impact on steering accuracy and driver confidence. As the car evolved, it grew and changed shape. Most call these the 2B, as raced through the end of 1965. The cars on show here were a 2A and a recreation of the 2B. One of them made a number of sorties up the hill, and you knew when it was being prepared, as the noise was really something else. Oldest Chevrolet here was this rather splendid 1938 Master de Luxe Coupe. The Chevrolet Master and Master Deluxe were made between 1933 and 1942 to replace the 1933 Eagle. It was the more expensive model in the Chevrolet range at this time, with the Mercury and Standard providing a cheaper and smaller range between 1933 and 1937. From 1940 a more expensive version based on the Master Deluxe was launched called the Special Deluxe. The Master name was used on a number of different versions, and the Series name changed each year. First of them was the Series CA Master which replaced the 1933 Eagle midway through the model year when the 1933 Standard model (Series CC) was introduced. Several changes were made to the Eagle when the name was changed to Master. The easiest to identify is the post between the front door wing windows and the roll down windows. On the Eagle the chrome divider between these two windows goes down as the window goes down, where as on the Master this divider remains fixed and does not go down with the window. The Series DA Master replaced the 1933 Eagle, with an increased wheelbase of 112 in. This increased the difference with the cheaper Standard wheelbase to 5 in. Powered by an upgraded version of the “Stovebolt Six”, 206 cu in (3,380 cc) six-cylinder engine, now producing 80 hp. In 1935, for the Series EA and ED, the Master underwent a redesign, utilising a new “Turret Top” construction method. In 1937, with the Series GA and GB, the Master now replaced the lower priced Standard Six, while the more luxurious new Master Deluxe edged the range upwards. The vehicle was shared with the Pontiac Deluxe. By 1938, now on the series HA and HB were selling well, with 162,430 and 302,728 respectively. The Master returned for 1939. The Master Deluxe was now the JA, while the base model was renamed the Master 85 (JB). A station wagon was offered, though its construction had been contracted to Mid States Body Corp. In 1940, with the Series KA and KB, the Master continued to be available in Master 85 (KB) as well as the more upscale “Master Deluxe” model (KA). The even better equipped “Special Deluxe” also appeared for the 1940 model year. After the end of the 1952 model year, the old Chevrolet nameplates — Special and Deluxe — were retired, and changed to 150 and 210, respectively, with trim similar to their respective former series. The Bel Air model became a full series, including two- and four-door sedans, station wagon and convertible; and represented the top-end model with features similar to the 1950-1952 models. The Chevrolet Two-Ten, or 210 was the midrange model of the Chevrolet car from 1953 to 1957. It took its name by shortening the production series number (2100) by one digit in order to capitalise on the 1950s trend toward numerical auto names. The numerical designation ‘”210″‘ was also sporadically used in company literature. The Two-Ten was discontinued after the 1957 model year to be replaced by the Biscayne. The 210 was the best-selling Chevrolet model during 1953 and 54, offering a balance of style and luxury appointments unavailable in the base 150 series, but was less costly than the glitzy Bel Air. Two-Tens offered the widest choice of body styles for 1953, including a convertible, Sport Coupe hardtop, two- and four-door sedans, and four-door station wagons. The 1953 and 1954 models were very similar, with only minor changes between the model years. Two engines were used in each of the ’53-’54 model years, the more powerful 115 hp Blue Flame unit used with the Powerglide automatic transmission. All Two-Tens had a 3 speed Synchromesh manual transmission as standard, with two optional transmissions. All engines are of the overhead valve design. They are commonly referred to as “Stovebolt Sixes” because of the large slotted-head screws used to fasten the valve cover and pushrod covers to the block. 1954 was the last year for 6 volt electrical systems in Chevrolet vehicles. The car seen here is a 1954 model. Chevrolet replaced the entire range of cars for 1955, producing what are sometimes referred to as the “Tri-Five” range, which would live for three years. Revolutionary in their day, they spawned a cult following that exists in clubs, website and even entire businesses that exclusively cater to the enthusiasts of the Tri Five automobiles. All featured a front-engine, rear-wheel-drive layout. They remain some of the most popular years for collectors and hot rodders. 1955-1957 were watershed years for Chevrolet, who spent a million dollars in 1956 alone for retooling, in order to make their less expensive Bel Air models look more like a Cadillac, culminating in 1957 with their most extravagant tailfins and Cadillac inspired bumper guards. In 1955, Americans purchased 7.1 million new automobiles, including 1.7 million Chevrolets, giving the company fully 44% of the low-price market and surpassing Ford in total unit sales by 250,000. The Bel Air was an instant hit with consumers, with Base One-Fifty models starting under $1600 and featuring a six cylinder engine. The introduction of the new optional 170 hpr 265ci V8, coupled with the Powerglide automatic transmission quickly earned the model the nickname “The Hot One”. In the first year of production, the oil filter was considered an option, although not having it led to significantly shorter engine life. With three basic model lines of 150, 210 and Bel Air and a range of body styles from 2 and 4 door Sedans to Coupes, Convertibles and Wagons, there were as many as 19 different Tri-five models available. The 1956 cars saw minor changes to the grille, trim and other accessories. It meant huge gains in sales for Chevrolet, who sold 104,849 Bel Air models, due in part to the new V8 engine introduced a year before. By this time, their 265cid V8 had gained popularity with hot rodders who found the engine easy to modify for horsepower gains. This wasn’t lost on Chevrolet’s engineers, who managed to up the horsepower in 1956 from 170 hp to 225 hp with optional add-ons. The average two door Bel Air in 1956 sold for $2100, which was considered a good value at the time. Prices ranging from $1665 for the 150 sedan with six cylinder engine to $2443 for the V8 equipped convertible, with Nomad models running slightly higher. Bigger changes came for 1957, including the large tailfins, “twin rocket” bonnet design, even more chrome, tri-colour paint and a choice from no less than seven different V8 engines. While in 1957, Ford outsold Chevrolet for the first time in a great while, years later the used 1957 Chevrolets would sell for hundreds more than their Ford counterparts. As the horsepower race continued, Chevrolet introduced a new version of their small block, with 283 cubic inches of displacement and 245 hp. They also introduced a limited number of Rochester fuel injected 283 engines that produced 283 hp, the first production engine to achieve 1 hp per cubic inch. For all intent and purposes, this made the 1957 Bel Air a “hot rod”, right off the production line. It was available with manual transmission only. The base 265cid engine saw an increase from 170 to 185 hp as well. While not as popular as the previous year’s offering, Chevrolet still managed to sell 1.5 million cars in 1957. Today, a 1957 Chevrolet Bel Air like this one is one of the most sought after collector cars ever produced. Joining it was a 1956 210 Wagon. For 1958, Chevrolet redesigned their range, creating cars which were longer, lower, and heavier than their 1957 predecessors, and the first ever production Chevrolet big block V8, the 348 cu in (5,700 cc), was now an option. The Bel Air gained a halo vehicle in 1958, the Impala, available only as a hardtop coupe and convertible in its introductory year. Impala styling followed the basic lines of the other Chevrolet models but received special styling cues including a different roof line, a vent above the rear window, unique side trim, and triple tail lights housed in slightly broader alcoves. For the budget conscious, the Biscayne, (formerly the 210) and the Delray (formerly the 150) completed this model year’s family-oriented and utility offerings. Chevrolet’s design for the year fared better than its other GM offerings, and lacked the overabundance of chrome found on Pontiacs, Oldsmobiles, Buicks and Cadillacs. Complementing Chevrolet’s front design was a broad grille and quad headlights that helped simulate a ‘Baby Cadillac’; the tail received a fan-shaped alcove on both side panels, which housed dual tail lights. Despite being a recession year, consumers made Chevrolet the No. 1 make of automobile (beating Ford, which held the title in 1957) and the Bel Air was at the core of Chevrolet’s popularity. With its wide variety of body styles and models, Bel Airs could be optioned with almost every conceivable luxury within the Chevrolet line. The Nomad station wagon name also reappeared in 1958 when the vehicle bowed as the premium four-door Chevrolet station wagon, lacking the unique styling of the 1955-57 Nomads. Most Chevrolet station wagon models had two tail lights (one on each side of the body) housed in abbreviated alcoves, which were made smaller to accommodate the rear gate. A new dash was used. The style only ran for a single year before being replaced by new designs for 1959. This rather distinctive and lightly customised car is a regular at this event. Chevrolet first used the Impala name in 1958, when it was applied to a new model which sat above the Bel Air as a top of the line model. It differed from the cheaper models in the range from behind the windscreen with a longer wheelbase even though the overall length was the same, as well as upgraded trim. It proved popular, accounting for 15% of total Chevrolet sales for the year. For 1959, Chevrolet completely redesigned their entire product range, and once again there was an Impala included. Sharing bodyshells with lower-end Buicks and Oldsmobiles as well as with Pontiac, part of a GM economy move, the Chevrolet’s wheelbase 1-1/2 inches longer. Using a new X-frame chassis, the roof line was three inches lower, bodies were two inches wider, and curb weight increased. Its tail fins protruded outward, rather than upward. The taillights were a large “teardrop” design at each side and were the largest yet (and indeed, ever) seen. The Impala became a separate model in its own right, adding a four-door hardtop and four-door sedan, to the two-door Sport Coupe and convertible. Sport Coupes featured a shortened roof line and wrap-over back window. The standard engine was an inline 6, while the base V8 was the carryover 283 cu in (4,640 cc), at 185 hp Optional were a 283 cu in with 290 hp and 348 cu in (5,700 cc) V8 up to 315 hp. Standard were front and rear armrests, an electric clock, dual sliding sun visors, and crank-operated front vent windows. A contoured hooded instrument panel held deep-set gauges. A six-way power seat was a new option, as was “Speedminder”, for the driver to set a needle at a specific speed and a buzzer would sound if the pre-set was exceeded. The model continued into 1960, though there were styling changes, with the tail fins reduced somewhat, as well as a reinstatement of three round taillights on each side, a non-functional front air intake scoops, and a white band running along the rear bumper. The available V8s were reduced to seven, in 283-cu in or 348-cu in displacements. The Turbo-Fire 283 cu in V8 could have either 170 or 230 hp. The 348 cu in was available in 250 to 320 hp with a 350 hp Super Turbo-Thrust Special with triple two-barrel carburettors, 11.25:1 compression ratio, and dual exhausts. Fuel injection was no longer an option on full-size Chevrolets. New to the options list was speed and cruise control. Production was 490,000 units before a completely new model appeared for 1961. Right hand drive models were made in Oshawa, Ontario in Canada, for New Zealand, Australia, and South Africa which were then assembled locally from CKD or SKD kits. The right-hand drive dashboard was a mirror image of the 1959 Chevrolet panel and shared with equivalent right-hand drive Pontiac models. Australian models were assembled by hand on the GMH Holden assembly lines. Seen here is a 1959 four-door hardtop with those amazing tail fins, a car which has appeared at Prescott many times in recent years. The Corvette is about as American a sports car as you can get, and this year there were examples from three of the seven generations which have been produced in the 64 years that the name has been extant. Oldest was a C1 car, dating from the middle of the model’s life The first generation of Corvette was introduced late in the 1953 model year. Originally designed as a show car for the 1953 Motorama display at the New York Auto Show, it generated enough interest to induce GM to make a production version to sell to the public. First production was on June 30, 1953. This generation was often referred to as the “solid-axle” models (the independent rear suspension was not introduced until the second generation).Three hundred hand-built polo white Corvette convertibles were produced for the 1953 model year. The 1954 model year vehicles could be ordered in Pennant Blue, Sportsman Red, Black, or Polo White. 3,640 were built, and sold slowly. The 1955 model offered a 265 cu in (4.34 litre) V8 engine as an option. With a large inventory of unsold 1954 models, GM limited production to 700 for 1955. With the new V8, the 0-60 mph time improved by 1.5 seconds. A new body was introduced for the 1956 model featuring a new “face” and side coves; the taillamp fins were also gone. An optional fuel injection system was made available in the middle of the 1957 model year. It was one of the first mass-produced engines in history to reach 1 bhp per cubic inch (16.4 cc) and Chevrolet’s advertising agency used a “one hp per cubic inch” slogan for advertising the 283 bhp 283 cu in (4.64 litre) Small-Block engine. Other options included power windows (1956), hydraulically operated power convertible top (1956), heavy duty brakes and suspension (1957), and four speed manual transmission (late 1957). Delco Radio transistorised signal-seeking “hybrid” car radio, which used both vacuum tubes and transistors in its radio’s circuitry (1956 option). The 1958 Corvette received a body and interior freshening which included a longer front end with quad headlamps, bumper exiting exhaust tips, a new steering wheel, and a dashboard with all gauges mounted directly in front of the driver. Exclusive to the 1958 model were bonnet louvres and twin trunk spears. The 1959–60 model years had few changes except a decreased amount of body chrome and more powerful engine offerings. In 1961, the rear of the car was completely redesigned with the addition of a “duck tail” with four round lights. The light treatment would continue for all following model year Corvettes until 2014. In 1962, the Chevrolet 283 cu in (4.64 litre) Small-Block was enlarged to 327 cu in (5.36 litre). In standard form it produced 250 bhp. For an extra 12% over list price, the fuel-injected version produced 360 bhp, making it the fastest of the C1 generation. 1962 was also the last year for the wrap around windshield, solid rear axle, and convertible-only body style. The boot lid and exposed headlamps did not reappear for many decades. An all-new C2 generation model was launched for 1963. The third generation Corvette, patterned after the Mako Shark II concept car, was introduced for the 1968 model year and was in production until 1982. C3 coupes featured the first use of T-top removable roof panels. The C3 introduced monikers that were later revived, such as LT-1, ZR-1, Z07 and Collector Edition. In 1978, the Corvette’s 25th anniversary was celebrated with a two-tone Silver Anniversary Edition and an Indy Pace Car replica edition of the C3. This was also the first time that a Corvette was used as a Pace Car for the Indianapolis 500. Engines and chassis components were mostly carried over from the C2, but the body and interior were new. The 350 cu in (5.7 litre) engine replaced the old 327 cu in (5.36 litre) as the base engine in 1969, but power remained at 300 bhp. 1969 was the only year for a C3 to optionally offer either a factory installed side exhaust or normal rear exit with chrome tips. The all-aluminium ZL1 engine was also new for 1969; the special big-block engine was listed at 430-hp , but was reported to produce 560 hp and propelled a ZL1 through the 1/4 mile in 10.89 seconds. There was an extended production run for the 1969 model year due a lengthy labour strike, which meant sales were down on the 1970 models, to 17,316. 1970 small-block power peaked with the optional high compression, high-revving LT-1 that produced 370 bhp. The 427 big-block was enlarged to 454 cu in (7.44 litre) with a 390 bhp rating. The ZR-1 special package was an option available on the 1970 through 1972 model years, and included the LT-1 engine combined with special racing equipment. Only 53 ZR-1’s were built. In 1971, to accommodate regular low-lead fuel with lower anti-knock properties, the engine compression ratios were lowered which resulted in reduced power ratings. The power rating for the 350 cu in (5.7 litre) L48 base engine decreased from 300 to 270 hp and the optional special high performance LT1 engine decreased from 370 to 330 hp. The big-block LS6 454 was reduced from 450 to 425 bhp, though it was not used in Corvettes for 1970; it was used in the Chevelle SS. For the 1972 model year, GM moved to the SAE Net measurement which resulted in further reduced, but more realistic, power ratings than the previous SAE Gross standard. Although the 1972 model’s 350 cu in horsepower was actually the same as that for the 1971 model year, the lower net horsepower numbers were used instead of gross horsepower. The L48 base engine was now rated at 200 bhp and the optional LT1 engine was now rated at 270 bhp. 1974 models had the last true dual exhaust system that was dropped on the 1975 models with the introduction of catalytic converters requiring the use of no-lead fuel. Engine power decreased with the base ZQ3 engine producing 165 bhp), the optional L82’s output 250 bhp, while the 454 big-block engine was discontinued. Gradual power increases after 1975 peaked with the 1980 model’s optional L82 producing 230 bhp. Styling changed subtly throughout the generation until 1978 for the car’s 25th anniversary. The Sting Ray nameplate was not used on the 1968 model, but Chevrolet still referred to the Corvette as a Sting Ray; however, the 1969 (through 1976) models used the “Stingray” name as one word, without the space. In 1970, the body design was updated including fender flares, and interiors were refined, which included redesigned seats, and indication lights near the gear shift that were an early use of fibre optics . Due to government regulation, the 1973 Corvette’s chrome front bumper was changed to a 5 mph system with a urethane bumper cover. 1973 Corvettes are unique in that sense, as they are the only year where the front bumper was polyurethane and the rear retained the chrome two-piece bumper set. 1973 was also the last year chrome bumpers were used. The optional wire-spoked wheel covers were offered for the last time in 1973. Only 45 Z07 were built in 1973. From 1974 onwards both the front and rear bumpers were polyurethane. In 1974, a 5-mph rear bumper system with a two-piece, tapering urethane bumper cover replaced the Kamm-tail and chrome bumper blades, and matched the new front design from the previous year. 1975 was the last year for the convertible, (which did not return for 11 years). For the 1976 models the fibreglass floor was replaced with steel panels to provide protection from the catalytic converter’s high operating temperature. 1977 was last year the tunnelled roof treatment with vertical back window was used, in addition leather seats were available at no additional cost for the first time. The 1978 25th Anniversary model introduced the fastback glass rear window and featured a new interior and dashboard. Corvette’s 25th anniversary was celebrated with the Indy 500 Pace Car limited edition and a Silver Anniversary model featuring silver over gray lower body paint. All 1979 models featured the previous year’s pace car seats and offered the front and rear spoilers as optional equipment. 53,807 were produced for the model year, making 1979 the peak production year for all versions of the Corvette. Sales have trended downward since then. In 1980, the Corvette received an integrated aerodynamic redesign that resulted in a significant reduction in drag. After several years of weight increases, 1980 Corvettes were lighter as engineers trimmed both body and chassis weight. In mid-1981, production shifted from St. Louis, Missouri to Bowling Green, Kentucky, and several two-tone paint options were offered. The 1981 models were the last available with a manual transmission until well into the 1984 production run. In 1982, a fuel-injected engine returned, and a final C3 tribute Collectors Edition featured an exclusive, opening rear window hatch. Final Corvette was a C7 model, the latest and current generation. You can buy a new one in the UK, through the one authorised dealer, though it will come with left hand drive, and it may not be quite the bargain that you thought it was going to be. I’ve driven one, in America, and just loved it (on American roads!). Oldest of the Chevrolet trucks here were a number of examples of the series known as the “Advance- Design”. Chevrolet’s first major redesign post-World War II, the Advance-Design series was billed as a bigger, stronger, and sleeker design in comparison to the earlier AK Series. First available on Saturday June 28, 1947, these trucks were sold with various minor changes over the years until March 25, 1955, when the Task Force Series trucks replaced the aging Advance-Design model. The same basic design family was used for all of its trucks including the Suburban, panel trucks, canopy express and cab overs. The Cab Overs used the same basic cab configuration and similar grille but used a shorter and taller bonnet and different bumpers. The unique Cab Over bumpers and bonnet required a custom cowl area which makes the Cab Over Engine cabs and normal truck cabs incompatible with one another while all truck cabs of all weights interchange. While General Motors used this front end sheet metal, and to a slightly lesser extent the cab, on all of its trucks except for the Cab Overs, there are three main sizes of this truck: the half-, three-quarter-, and full ton capacities in short and long wheelbase. From 1947 until 1955, Chevrolet trucks were number one in sales in the United States, with rebranded versions sold at GMC locations. Follow-on truck was known as the Task Force, Chevrolet’s successor to the Advance Design trucks of the early 1950s. The Task Force Series ran from late 1955 (second series) through 1959. A similar GMC version was offered, called the Blue Chip Series. As well as the new styling, the 1955 second series offered standard options and add-ons such as 12-volt electrical systems, the first V8 (the 265 cubic inch), and fleet-side six-, seven-, and eight-foot length beds. It featured a new “wrap-around” windscreen—a truck industry first—and optional wrap-around rear window on Deluxe cabs. Power steering and power brakes became available for the first time on GM trucks. Minor changes were made to the grille, bumpers and trim features in the following couple of years before some more significant changes in 1958 which included a significant redesign of the front end, and with this came new names . All light-duty trucks were now called “Apaches”, medium-duty trucks called “Vikings”, and heavy-duty trucks called “Spartans”. There were four headlights instead of the previous two and a shorter, wider grille running the width of the front end. Parking lights were now in the grille instead of being in the front of the fender and the bonnet was similar to 1955/1956 models, but with a flat “valley” in the middle. This was the first year for factory-equipped air conditioning. Minimal changes were made in 1959, the most apparent being a larger and more ornate bonnet emblem and redesigned badging on the fenders. This one dates from 1976, and is an example of the C/K Series truck which was Chevrolet’s rival to the Ford F-150 of the era. An all-new clean sheet redesign of General Motors’ Chevrolet and GMC brand C/K-Series pickups had débuted in mid-1972 for the 1973 model year. Development of the new third-generation trucks began in 1968 with vehicle components undergoing simulated testing on computers before the first prototype pickups were even built for real world testing. The redesign was revolutionary in appearance at the time, particularly the cab, departing from typical American pickup truck designs of the era. Aside from being near twins, the Chevrolet and GMC pickups looked like nothing else on the road.] The third-generation trucks are colloquially known as the “Square-body” or “Box-body” generation. GM’s official “Rounded-Line” moniker highlighted the pickup’s rounded styling cues that were incorporated into the design. This included rounded windshield corners, rounded corners of the cab roof, rounded-corner doors which cut high into the cab roof eliminating roof height, slanted front fenders, and rounded pickup box corners which allowed for rounded wraparound taillamps, a first for GM pickups. The design also featured strong distinctive curved shoulderlines which rounded out below the beltline. The curved shoulderline continued across the back tailgate on Chevrolet Fleetside and GMC Wideside models. However, the low slope of the hood and rectangular front end of the truck originated the “square/box-body” nickname, which was propagated through truck magazines and word of mouth. GM’s design engineers fashioned the “Rounded-line” exterior in an effort to help improve aerodynamics and fuel efficiency, using wind tunnel technology to help them sculpt the body. Other design traits include sleek sculpted body work, an aerodynamic cab with steep windshield rake, and a unique available hidden radio antenna embedded into the windshield glass. There were two types of pickup boxes to choose from. The first type, called Fleetside by Chevrolet and Wideside by GMC, was a full width pickup box and featured a flared shoulderline to complement the cab in addition to rounded box corners and the new aforementioned rounded wraparound taillamps. Both steel and wood floors were available. The second type, called Stepside by Chevrolet and Fenderside by GMC, was a narrow width pickup box featuring steps and exposed fenders with standalone tail lamps. Initially, only wood floors were available. The wheelbase length was extended to 117.5 in for the short wheelbase pickups, and 131.5 in for the long wheelbase pickups. A new dual rear wheel option called “Big Dooley” was introduced on one-ton pickups, along with a new Crew Cab option on the 164.5 in (4,178 mm) wheelbase. An optional Elimipitch camper was made available for the Big Dooley. Crew Cabs were available on C20, C30, and K20 models in two versions: a “3+3” which seated up to six occupants and “bonus cab” which deleted the rear seat and added rear lockable storage in its place. The fuel tank was moved from the cab to the outside of the frame, and a dual tank option was available which brought fuel capacity to 40 US gallons. 1980 was the first year that a cassette tape player could be purchased, along with a CB radio. The Rounded-Line generation ultimately ran for a lengthy 15 model years (1973–1987) with the exception of the Crew Cab (four-door cab), Blazer, Jimmy, and Suburban versions, which continued up until the 1991 model year. GM ends this generation with 1987 as 1987 was the last model year for the conventional cabs (two-door cab). Chevrolet first introduced the El Camino in 1959 as a direct response to the success of the Ford Ranchero. Like the Ford it was based on the full-sized sedan of the era. It was only produced for a couple of years, but then in 1964, Chevrolet reintroduced an all new, mid-size El Camino four years later based on the Chevrolet Chevelle. There was a new and longer El Camino in 1968, based on the Chevelle station wagon/four-door sedan wheelbase (116 in), overall length: 208 in; it also shared Chevelle Malibu exterior and interior trims. The interior was revamped including cloth and vinyl or all-vinyl bench seats and deep twist carpeting. All-vinyl Strato bucket seats and center console were an $111 option. Power front disc brakes and Positraction were optional. A new, high-performance Super Sport SS396 version was launched. The Turbo-Jet 396 had 325 bhp or 350 bhp versions. Returning to the official options list for the first time since late 1966 was the 375 bhp (280 kW) L78. It had solid lifters, big-port heads, and an 800 cfm Holley four-barrel on a low-rise aluminium manifold. A three-speed manual was standard with all engines, and a four-speed or automatic was optional. In 1968, the SS was a separate model (the “SS-396”). The 1969 models showed only minor changes, led by more-rounded front-end styling. A single chrome bar connected quad headlights, and a slotted bumper held the parking lights. New round instrument pods replaced the former linear layout. For the first time, the Chevrolet 350 V8 was used in an El Camino. The Super Sport group included a 265- or 325-horsepower 396-cubic-inch V8 beneath a double-domed bonnet, along with a black-out grille displaying an SS emblem. More potent editions of the 396 engine, developing 350 or 375 horsepower also made the options list. Options included power windows and locks. Curiously, back-up lights moved from the rear bumper to the tailgate, where they were ineffective when the gate was down. The 1970 models received sheet metal revisions that gave the bodies a more squared-up stance, and interiors were also redesigned. The new SS396, which actually displaced 402 cu in (6.6 L) (although all emblems read 396) was available. Chevrolet’s largest and most-powerful engine of the time was also put into a select few El Caminos. The LS6 454 CID engine, rated at 450 hp and 500 lb⋅ft (680 N⋅m) of torque, gave the El Camino 1/4-mile times in the lower 13-second range at around 108 mph. The 1971 El Camino got fresh front-end styling that included large Power-Beam single-unit headlights, a reworked grille and bumper, and integral park/signal/marker lights. For 1971, mandated lower-octane unleaded fuel necessitated a reduction in engine compression, and GM’s A.I.R. system, a “smog pump”, was added to control tailpipe emissions. Power and performance were reduced. Engine offerings for 1971 included the 250-6, small-block V8s of 307 and 350 cubic inches; and big block V8s of 402 and 454-cubic-inch displacements. Horsepower ratings of those engines for 1971 ranged from 145 for the six to 365 for the RPO LS5 454 – all in gross figures. The LS6 454 V8 was gone forever. A rebadged El Camino, the GMC Sprint debuted in 1971. It shared the same engine and transmission offerings as its Chevrolet counterpart. The 1972 El Caminos wore single-unit parking and side marker lights on their front fenders, outside of a revised twin-bar grille, but little changed. For 1972, horsepower measurements were switched to the “net” figures as installed in a vehicle with all accessories and emission controls hooked up. Engine offerings included the 110 horsepower (82 kW) 250-6, a 307 V8, a 175 horsepower (130 kW) 350-cubic-inch V8, and big block V8s of 402 and 454 cubic-inch displacements. The 402-cubic-inch (still known as a 396) produced 240 horsepower (180 kW); the 454 managed to put out 270 horsepower under the net rating system. Super Sport equipment could now be ordered with any V8 engine, including the base 307-cubic-inch version. All 1972 El Caminos with the 454 ci engine have a “W” as the fifth digit in the VIN, and the 454 was only available with Super Sport trim. A new generation model appeared for 1974. A very different sort of Chevrolet Pickup was this SSR. Made between 2003 and 2006, the SSR (Super Sport Roadster) was based on the long-wheelbase Chevrolet TrailBlazer EXT’s platform, and featured “retro” styling and a steel retractable hardtop designed by ASC. The production model was based on the SuperSport Roadster concept car shown at the 2000 Detroit Auto Show. An early-production SSR was the pace car for the 2003 Indianapolis 500 auto race.The 2003 and 2004 models used General Motors’ Vortec 5300 engine, a 5.3 litre 300 hp V8. Performance was 7.7 seconds for 0–60 mph with a 15.9 secs 94mph quarter mile run. The 2005 SSR used the 390 hp LS2 V8 also found in the C6 Corvette, Trailblazer SS, and Pontiac GTO, and also offered a manual transmission (the six-speed Tremec) for the first time, as an option. For the 2006 model year, the LS2 engine featured minor modifications that boosted its output to 395 hp (automatic) and 400 hp (manual transmission), respectively. The 2004 model sold below expectations with under 9,000 sales at US$42,000 each. Citing a 301-day supply of SSRs, General Motors in December of that year announced five weeks of layoffs at Lansing Craft Center, the factory that made the SSR. On November 21, 2005, GM announced that it would close the Craft Center in mid-2006, spelling the end for the SSR. The final SSR, a unique black-on-silver model was built on March 17, 2006. Analysts estimate that 24,150 SSRs were produced in total. One of the real highlights of the event were this trio of racing Camaro models, which made their presence felt and heard in a gloriously noisy way. Oldest of them was the Roger Penske 1969 Camaro Z28 Penske Sunoco, in its distinctive Penske livery of royal blue and yellow. Penske built a number of Camaros for Mark Donohue and others to drive in the SCCA Trans Am Series. To make the first car more competitive, they reduced the weight of the body by acid dipping it, which apparently slipped under the scrutineer’s radar and reputedly made the car 250 lbs underweight. It was joined by the iconic 1977 Chevrolet Camaro black 7 International Race of Champions car raced by Unser and Fittipaldi dubbed ‘lucky number seven’ due to its very prestigious accomplishments on the racing circuit. It raced through to the 1980 IROC Series finale and this 500 bhp car looks like it apparently did when new. The final car was the 1976 Group 2 Faberge Brut Chevrolet Camaro, which Stuart Graham campaigned in Europe when it was new. It carried over the black and green livery from the earlier Camaros of the two previous seasons . This particular Camaro races extensively at Goodwood and is considered by many as the ultimate Group 2 saloon. Historic British Saloon Car Racing driver Stuart Graham came to Prescott with its owner Nigel Garrett to demonstrate the 7.4 litre Chevrolet big block, 600bhp Faberge-liveried beast. The rear axle is 5 linked, front suspension is parallel wishbones, brakes are discs all round with period AP calipers and in race trim runs large slicks under the wheel arch extensions. Throughout the‘70s, Stuart Graham’s big V8 Chevrolet Camaro was the car to beat in the British Championships. He won touring car races, titles and awards in the UK, Europe and overseas racing Camaros and was the first person since Freddie Dixon pre-war, to win both bike and car TTs. Oldest of the Chrysler models here is this 1929 Model 80, which sports a 4.1 litre engine. It is something of a Prescott regular, being seen in the car park here on many occasions during the year. This quite neat-looking, but physically massive saloon is a 1970 Newport, and it features a 7.2 litre engine. The Newport was Chrysler’s lowest priced model range, and the name was first used on a concept car in 1940, and then applied to a cars in the early 40s and 50s before being used for a series of models starting in 1961. By the time of the complete redesigned for the 1969 model year, it was onto the fifth generation. The new cars featured the distinctive “Fuselage Styling” that would become symbolic of Chrysler’s full-size cars until the end of the 1973 model year. Although retaining the same 124 in (3,150 mm) wheelbase that it shared with the premium New Yorker, this generation Newport was longer, lower, wider, and several hundred pounds heavier than the 1965–1968 Newports. Although still offered in 2-door and 4-door hardtop, 2-door convertible, and 4-door sedan models, station wagons were no longer part of the Newport series, as the Town & Country became a separate model outright. Newport convertibles were discontinued after 1970, following a drop in sales of 48% that year, to 1,124 convertibles; while total Newport sales were down almost 30%, to 110,292 units, despite the restyling. Available in 2- and 4-door hardtops and 4-door sedans, the Newport Custom would still be offered as the top-line Newport through the entire 1969–1973 design cycle. First appearing in 1971, the Newport Royal was an entry-level model in the Newport Series. It borrowed the name of the entry-level Chrysler from 1937–50; but the Royal name was dropped in 1972. For the 1971 model year, the Royal came standard with the 255 hp 5.9 litre V8, with optional 275 hp or 300 hp 6.3 litre) engines, but not the 7.2 litre; the Custom was standard with the 275 hp 6.3 litre) V8, and the 300 hp 6.3 litre) or 335 hp 7.2 litre V8s as options. For 1972, the Royal came standard with the 175 hp 5.9 litre) V8, with larger-displacement engines unavailable, while the Custom was standard with the 190 hp 6.6 litre) V8, and the 225 hp single- and 245 hp dual-exhaust 7.2 litre) V8s were optional. Power output would steadily decrease on all engines during this generation due to stricter emissions standards and rising fuel prices. A new design with more slab-sided styling was launched for the 1974 model year. This 1999 Ram Pickup is from the second generation of truck to bear the name. The Ram line was redesigned for the 1994 model year. Development on a second generation began in 1986, ending in late 1992. A more conventional design was originally scheduled for a 1991 production; when Bob Lutz showed it to the new styling designers, chief designer Phillip E. Payne told him, “It looks like nothing more than a rehash of everybody else’s truck.” At that, Lutz told him he had six months to come up with something better. The exterior styling of the truck that was eventually released was the result of design concepts by Payne during 1988-1990. A review by the Dodge pick-up truck studio designers felt that modern pick-ups looked “too flat and sedan like”, while the early 50’s Studebaker pick-up and the semi-trailer trucks had just the right “macho” look to them. The design featured a big-rig-looking front end and a large grille that was nothing like the current Ford or Chevy/GMC pickups in design. The Dodge Ram Pick-up was selected as “Truck of the Year” for 1994. The redesigned 1994 Ram was a sales success, with sales rocketing from 95,542 units in 1993 to 232,092 in 1994, 410,000 in 1995, and 411,000 by 1996. That year, it was prominently featured as the hero vehicle in the film Twister. Sales of this generation peaked at just over 400,000 in 1999 before declining against the redesigned Ford and GM trucks. By 2001, Ram sales figures were below those of Ford and Chevy trucks. Engine offerings continued over from the first-generation Ram and were the 3.9 litre V6, 5.2 and 5.9 litre V8, and 5.9 litre I6 Cummins turbo diesel. Added to the line up was a new 488 cubic inch 8.0 litre V10 engine designed as an alternative for those who wanted superior pulling power but did not want a diesel. The new V10 and Cummins turbo diesel could only be had in the 2500 and higher designation models. Models were now the 1500 half-ton, 2500 three-quarter-ton, and 3500 dual-rear-wheel one-ton in both 2- and 4-wheel drive. 1500 Rams offered both 6.5- and 8-foot boxes. 2500 Rams offered 6.5-foot boxes with club or quad Cabs. Dodge offered the 2500 series in two different gross-vehicle-weight ratings for the first few years, but this was later dropped. The purpose of the difference between the light-duty and heavy-duty 2500 trucks was for the heavy-duty 2500 to take the place of the discontinued one-ton single-rear-wheel trucks. Rear axles for the light-duty 2500 trucks were semi-floating, while the heavy-duty 2500 rear axles were full-floating. On the inside, special attention was paid to in-cab storage features, with a large glovebox, a center armrest storage area, and extra storage space behind the seat. The dash and gauge cluster were a far cry from the previous model Ram and were far more modern as well. A redesign of the dashboard and instrument cluster was introduced in 1998 along with the introduction of the quad cab, and rounded black plastic side-view mirrors replaced the previous rectangular design. In 1998, Dodge introduced the “Quad Cab”, which uses smaller, “suicide” doors directly behind the main doors. This was offered as an option on the “Club Cab” for this model year. Other changes for 1998 included rounded mirrors replacing the classic square ones, a revised interior, dual airbags, a chime replacing the buzzer for seat belts/door ajar/headlights/ and a digital odometer. The OBD II System was also standard, with a computer port near the driver’s-side footwell and a code-checking system via the new digital odometer readout. In late 1998 Dodge introduced a revised front end for the 1999 model year Sport models with a restyled bumper, quad-beam clear-lens headlamps, and body-colour grille. A 6-speed manual transmission was made optional for diesel variants in late 2000 for the 2001 model year. A small percentage of the diesel engines for 1999 and 2000 model years were subject to problems within the water jackets and fuel injectors. The most problematic was the “53” stamped engine block which had a defect that would cause fracturing in the structure of the block itself. The 2000 models became optional with heated leather seats. The braking system was upgraded to dual-piston calipers in the front. An Offroad Edition was offered as a package with a 2-inch lift accomplished with stiffer front springs and rear lift blocks, unique 17×8 rims, 275/70/17 all terrain tyres, 4.10 gears, trussed Dana 44 in the front, limited slip differential, and skid plates. The Offroad Edition models are also distinguishable with an additional decal on the tailgate under the 4×4 decal that says “Offroad.” Although Dodge introduced a new Ram 1500 for 2002, the old second-generation style Ram was carried over for the 2002 model year heavy-duty 2500 and 3500 trucks. The new third-generation Ram would not appear in the 2500/3500 variants until 2002 as 2003 models. Part of this delay was due to the then new 5.7 litre Hemi engine not being ready for production. The Viper started out as a concept car, but, unlike most such show cars, as Chrysler Corp have proved several times in recent years, public reaction was such that the model was put into production. Initially offered as an open topped roadster, the GTS Coupe was added to the range in 1996. Dubbed the “double bubble”, the roof featured slightly raised sections that looked like a bubble to accommodate the usage of helmets and taking design cues from the Pete Brock designed Shelby Daytona. More than 90% of the GTS was new in comparison to the RT/10 despite similar looks. The GTS came with the same 8.0 litre V-10 engine but power would be increased to 450 hp. This was the first Viper to be equipped with airbags and also included air conditioning, power windows and door locks. The model was chosen as the pace car for the Indianapolis 500. These days the cars still turn heads everywhere they go. From the early days of the Ford motor car were the Model T and its eventual replacement, the Model A, seen in four door guise. When Ford introduced the Model A in late 1927, there were several competitors also offering four cylinder cars, among them Chevrolet, Dodge, Durant, or Willys. That changed within a few years, soon leaving the new Plymouth the sole major make in the Ford’s price class with a four, so when it came to the time to replace the Model A, in 1932, Ford knew they needed to do something special. With the main rivals having moved to 6 cylinder engines, Ford took a gamble and decided to go one stage further so as well as the short-lived 4 cylinder Model B, they announced a range of cars with a standard V8. The same bodies were available on both the Model B and the Model 18, as the first year’s production of cars with the flathead V8 was called. For 1933 this latter was replaced by the Model 40, and the changes made were substantial, which was something of a surprise considering how much change had been introduced the previous year. For its second year, the wheelbase was stretched, by 6 inches to 112 inches on a new cross-member frame. The grille was revised, gaining a pointed forward slope at the bottom which resembled either a shovel or the 1932 Packard Light Eight. Both the grille and hood louvres curved down and forward. The overall design and grille were inspired by the English Ford Model Y. Streamlining was further accentuated by the new hood which now covered the cowl, giving an impression of more length. In addition, there were more rounded and skirted fenders and new, elegantly bowed bumpers. Headlamp support bars were no longer in use, and there were new wire wheels. The cars got a new dashboard with instruments set in an oval insert in front of the driver. There was a glove box on the passenger side. Closed Deluxe models received heavy DI-NOC wood-graining on dash and window frames, and there were deeper seat cushions. There were 10 body styles, or 14 if standard and Deluxe trim levels are counted separately. Now, all were available for V-8s and the Model B, which thus got Deluxe models, too. Convertible Coupes and Victoria came in Deluxe trim only, and the most expensive car in the line, the “woody”, as a Standard only. The cars gained about 3% in weight, compensated for with more powerful engines, as on the V-8 with its 15% increase in power. Total sales for the model year were up to 334,969 for the calendar year. Further changes were made for 1934, with output of the V8 engine up from 75 to 85 bhp, and some cosmetic alterations to the grille and bonnet louvres made the cars easy to spot. The 1934 de Luxe gained a certain notoriety as this was the car in which famous outlaws Bonnie and Clyde were killed. V8s are popular for customising, but there are still plenty of original cars around and there was one of those here, a 1934 Phaeton. This is a 1961 Falcon, one of the array of “compact” cars that America produced in the early 1960s. Historically, the “Big Three” auto manufacturers (GM, Ford and Chrysler), had focused purely on the larger and more profitable vehicles in the US and Canadian markets. Towards the end of the 1950s, all three manufacturers realised that this strategy would no longer work. Large automobiles were becoming increasingly expensive, making smaller cars such as Fiats, Renaults, Toyotas, and Volkswagens increasingly attractive. Furthermore, many American families were now in the market for a second car, and market research showed women especially thought the full-size car had grown too large and cumbersome. At the same time, research showed many buyers would prefer to buy US or Canadian if the domestic manufacturers offered a smaller car with lower cost of ownership. Thus, all three introduced compacts: the Valiant from Chrysler (becoming the Plymouth Valiant in 1961, and joined by a downsized Dodge Dart in 1962), GM’s Chevrolet Corvair, and the Ford Falcon. Studebaker also introduced the Lark, and Rambler downsized its near-compact American in 1960. The project which became the Falcon was started and sponsored by Ford General Manager Robert S. McNamara, who commissioned a team to create what by American standards of the time would be a small car but elsewhere in the world considered a mid-size. McNamara, who was promoted to Group Vice President of Cars and Trucks by the time the Falcon was launched, was intimately involved in development, insisting on keeping the costs and weight of the car as low as possible. Engineer Harley Copp employed a unibody atop a standard suspension and sourced parts from Ford’s existing bin to keep the price low yet provide room for six passengers in reasonable comfort. The sales success of the conventional Falcon along with slow sales of GM’s rear-engined Corvair led General Motors to introduce their own compact car based on the Falcon’s principles, the Chevy II. The 1960 Falcon was powered by a small, lightweight 95 hp 2.4 litre Mileage Maker straight-6 with a single-barrel carburettor. Construction was unibody, and suspension was fairly standard, with coil springs in front and leaf springs in the rear. Brakes were drum all around. A three-speed manual column shift was standard, and the two-speed Ford-O-Matic automatic was optional. There was room for six passengers in reasonable comfort in the simple interior. Body styles included two- and four-door sedans, two- or four-door station wagons, and the Ranchero car-based pickup, transferred onto the Falcon platform for 1960 from the Fairlane. A Mercury derivative, the Mercury Comet, originally intended for the defunct Edsel marque, was launched in the US midway through the 1960 model year. Robert McNamara, a Ford executive who became Ford’s president briefly before being offered the job of U.S. Defense Secretary, is regarded by many as “the father of the Falcon”. McNamara left Ford shortly after the Falcon’s introduction, but his faith in the concept was vindicated with record sales; over half a million sold in the first year and over a million sold by the end of the second year. The 1961 model year introduced an optional 101 hp, 2.8 litre six, and two new models were introduced; a bucket-seat and console sedan model in a higher trim level called the Futura, and a sedan delivery. Also, the Ford Falcon brochure featured Charlie Brown and Lucy from the Peanuts comic strip who remained until 1965. Ford boasted of the good fuel economy achieved by the six-cylinder Ford Falcon models in advertising. The fuel economy was good, a claimed 30 mpg‑US, compared to other American cars at the time. The 1962 model year had a Squire model of the four-door station wagon with faux wood trim on the sides. The bucket-seat “Futura” model was offered with a slightly upgraded interior, factory-installed safety belts, different side trim (spears), and different emblems. Halfway through the model year, Ford changed the roof line at the back window to more of a Thunderbird design and offered a four-speed transmission for the first time. The two-door Futura sedan (also referred to as an ‘illusion hardtop’ because of the chrome trim around the side window opening) sported a flat rear window in place of the panoramic (wrap-around) window on earlier models to bring its design in line with other Ford cars of the era. In 1962, Ford introduced the Ford Falcon Club Wagon and Deluxe Club Wagon, an eight-passenger, flat-front, van. Ford also promoted that in a Mobilgas economy run, the Falcon got 32.5mpg. In 1963, even more models were available. There was now a four-door Futura and a Deluxe wagon. Futura Convertible and Futura Sports Convertible models were also included in the 1963 range. Later, hardtops, and the new “Sprint” model were introduced. Halfway through the model year (February 1963), the Fairlane’s 164 hp “Challenger” 4.3 litre V8 engine was offered for the first time. The Falcon was climbing in trim level from its budget beginnings, as Ford attempted to wring more profit from the line. The only time a V8 option was available in a first-generation Falcon was the 1963½ model, and these cars were produced in very limited numbers (Sprint two-door hardtop (bucket seats) 10,479 produced and Sprint convertible (bucket seats) 4,602 produced). These first-generation Falcon Sprint cars were the basis for the 1964½ Mustangs released by Ford one year later. Many (if not most) of the interior, chassis, suspension, and drivetrain components were derived from those used on the 1963½ Ford Falcon Sprint and/or Fairlane models. In simplest terms, the 1963½ Falcon Sprint is nearly mechanically identical to the 1964½ Mustang while being aesthetically different. A completely new (and larger) model arrived for 1964. Looking very much more like people think an early 60s American car should do is this massive 1963 Galaxie Coupe. The Galaxie name was used for the top models in Ford’s full-size range from 1958 until 1961, in a marketing attempt to appeal to the excitement surrounding the Space Race. For 1962, all full-size Fords wore the Galaxie badge, with “500” and “500/XL” denoting the higher series. The Galaxie 500/LTD was introduced for 1965 followed by the Galaxie 500 7-Litre for 1966. The Galaxie 500 part was dropped from the LTD in 1966, and from the XL in 1967; however the basic series structuring levels were maintained. The “regular” Galaxie 500 continued below the LTD as Ford’s mid-level full-size model from 1965 until its demise at the end of the 1974 model year The Galaxie was Ford’s rival to the full-sized Chevrolet Impala throughout the 1960s, and to keep up with GM’s big selling model, there were frequent updates. The basic model seen here was first seen in 1960, but it underwent annual changes. The 1963 model was essentially unchanged save for some freshening and added trim; windscreens were reshaped and a four-door hardtop 500/XL was added. A lower, fastback roofline was added mid-year to improve looks and make the big cars more competitive on the NASCAR tracks with the added downforce. This 1963½ model, the industry’s first official “½ year” model, was called the “sports hardtop” or “fastback” (it shared this feature with the for 1963½ Falcon). Galaxie buyers showed their preference as the new sports hardtop models handily outsold the “boxtop” square-roof models. The sports hardtop was available in both Galaxie 500, and Galaxie 500/XL trim. Mercury also received the new roofline (under the Marauder badge) in Monterey, Montclair, and Park Lane models. This year, a no-frills big Ford, priced around $100.00 below the base Galaxie sedans. was offered, badged as the Ford 300. It was offered for 1963 only, and was replaced by the Custom series in 1964. Further alterations would follow for 1964, when the interior trim was altered, and the exterior featured a more sculpted look which was actually designed to make the car more aerodynamic for NASCAR. The formal-roof “boxtop” style was replaced by a slanted-roof design for all non-wagon or convertible models, including sedans. The base 300 was replaced by a line of Custom and Custom 500 models. The 289 continued as the base V8 and was standard in the XL series. XL models got new thin-shell bucket seats with chrome trim. Federal regulations now required lap-style safety belts for both front outboard occupants. The 427 cu in (7.0 litre) engine was used in 50 lightweight fibreglass-equipped cars for drag racing. These competed in North America but were still too heavy and Ford introduced the lightweight Fairlane Thunderbolt. The Ford Country Squire station wagon, while wearing “Country Squire” badging, was actually part of the Galaxie 500 line. Some Country Squires had “Galaxie 500” badging on the glovebox indicating the series name. These wagons featured the same trims as Galaxie 500s, and were a step up from the base-model Country Sedan. An entirely new design was launched for 1965. A year newer than that was this 1964 Thunderbird. For 1964 the Thunderbird was restyled in favour of a more squared-off appearance, which was mostly evident when viewing the car from the side or rear. Hinting at its roots in the previous generation Thunderbird that it evolved from, the new model retained a similar grille design with quad headlights and a 113.2 inches wheelbase. As before, the new Thunderbird continued to be offered in hardtop, convertible, and Landau versions. The 300 horsepower 6.4 litre V8 continued as the standard engine for the Thunderbird. It was paired with a 3-speed automatic transmission. For 1965, sequential turn signals were added, flashing the individual segments of the broad, horizontal tail lights in sequences from inside to outside to indicate a turn. Also new for 1965 were standard front disc brakes, and doubled sided keys. Even though it was the last year of the generation, 1966 saw a stylistic revision for the Thunderbird highlighted by a new egg-crate style grille with a large Thunderbird emblem at its centre and a single-blade front bumper. The rear bumper was restyled to include new full-width taillamps. Engine choices were also revised for 1966. The standard 390 cu in (6.4 litre) V8 equipped with a single four-barrel carburettor produced 315 horsepower. Newly optional and taking the top position for performance was a 345 horsepower 428 cu in (7.0 litre) FE V8. The 428 cost only $86 over the base engine, and was a popular option. This would be the last year for the convertible until the “retro” models of 2002-05. It was not really a surprise to find examples of the Mustang here, with a number of the early first generation cars on show. Drawing on inspiration from the mid-engined Ford Mustang I concept vehicle, Lee Iacocca ordered development of a new “small car” to vice-president of design at Ford, Eugene Bordinat. Bordinat tasked Ford’s three design studios (Ford, Lincoln-Mercury, and Advanced Design) to create proposals for the new vehicle. The design teams had been given five goals for the design of the Mustang: It would seat four, have bucket seats and a floor mounted shifter, weigh no more than 2,500 pounds (1,100 kg) and be no more than 180 inches (4,572 mm) in length, sell for less than $2,500, and have multiple power, comfort, and luxury options. The Lincoln–Mercury design studio ultimately produced the winning design in the intramural contest, under Project Design Chief Joe Oros and his team of L. David Ash, Gale Halderman, and John Foster. Development of the Mustang was completed in a record 18 months from September 1962 to March 1964. and Iacocca himself championed the project as Ford Division general manager. The styling is often credited to one person, and that is not accurate, as this was very much a team effort, it has been reported by those involved. To decrease developmental costs, the Mustang used chassis, suspension, and drivetrain components derived from the Ford Falcon and Fairlane. It used a unitised platform-type frame from the 1964 Falcon, and welded box-section side rails, including welded crossmembers. Although hardtop Mustangs accounted for the highest sales, durability problems with the new frame led to the engineering of a convertible first, which ensured adequate stiffness. Overall length of the Mustang and Falcon was identical, although the Mustang’s wheelbase was slightly shorter. With an overall width of 68.2 in (1,732 mm), it was 2.4 in (61 mm) narrower, yet the wheel track was nearly identical. Shipping weight, approximately 2,570 lb (1,166 kg) with the straight six-cylinder engine, was also similar to the Falcon. A fully equipped V8 model weighed approximately 3,000 lb (1,361 kg). Although most of the mechanical parts were from the Falcon, the Mustang’s body was completely different; sporting a shorter wheelbase, wider track, lower seating position and lower overall height. An industry first, the “torque box” was an innovative structural system that greatly stiffened the Mustang’s construction and helped contribute to better handling. The car was launched in 17th April 1964, as a hardtop and a convertible, with the fastback version following in August. It was an instant sensation, with demand massively exceeding supply. There was also an example of the “rent-a-racer”, the 1966 Mustang Shelby GT350H. These were produced for Hertz in 1966 and were based on the Shelby GT350 model The deal with the Hertz Corporation to offer ~1,000 GT350s for rental that, after their rental-car lives were finished, were returned to Ford, refurbished, and sold to the public as “GT350H” models. Most Hertz cars were black with gold LeMans stripes and rocker panel stripes, although a few were white with blue stripes. The first 85 Hertz cars were available with four-speed manual transmissions and Hertz advertised them as “Rent-a-Racer” cars. During rental, these cars were sometimes used as production class cars at SCCA events, and were rumoured to have been returned to Hertz with evidence of roll bars being welded in. Ford pushed another 800 models on Hertz with black paint, gold stripes and black interior, as well as automatic transmissions. When the Hertz cars were returned to Ford to be prepared for sale to the public, the high-performance parts were often “lost” (presumably at the manufacturer) before final sale. The program was extremely popular at the time. and provided the inspiration for a series of more recent recreations of the concept of special version of the Mustang, with Shelby parts and approval. There were also a couple of the latest Mustang here. Finally, after more than 50 years, the car is being officially sold new in the UK with right hand drive, and, as predicted, the car is proving quite popular, with more of the orders for the 5 litre V8 than the rather cheaper to run 2.3 litre Ecoboost Turbo 4. The Ford F Series pickup has been the best-selling vehicle in America for as long as people can remember. And it owes its existence to this, the very first generation of the long-running series. The first F-Series truck (known as the Ford Bonus-Built) was introduced in late 1947, going on sale on January 16, 1948 as a replacement for the pre-War designed Ford trucks. It had a flat, one-piece windshield and integrated headlamps and a wider cab. Options included the “See-Clear” windshield washer (operated by foot plunger), passenger-side windshield wiper & sun visor, and passenger-side taillight. The F-1 truck was also available with additional chrome trim and two horns as an option. All F-series were available with optional “Marmon-Herrington All Wheel Drive” until 1959. The design of the F-Series truck changed tremendously from 1950 to 1954. From 1948 to 1950, the grille was a series of horizontal bars and the headlights were set into the fenders. For 1951 and 1952, the headlights were connected by a wide aerodynamic cross piece with three similarly aerodynamic supports. The rear window was wider in these later trucks and the dashboard was redesigned. This new cab was called the “Five-Star Cab”. The F-Series was sold in four basic models. Along with the pickup truck (F-1 through F3), the F-Series was sold as a panel truck (based on the pickup), COE/cab-over engine chassis (F-5 and F-6, branded C-Series) and school bus chassis (F-5 and F-6, branded B-Series). Above the F-5, the F-Series was a medium-duty and heavy-duty conventional truck sharing the bodywork of the smaller F-Series. An all -new model appeared in 1954. This 1973 Econoline van is an example of the second series of the model, produced from 1969 to 1974. As the result of a lengthy United Auto Workers strike in the 1967, the launch of the second-generation Econoline van was delayed almost four months until January 1968. Instead of calling it a 1968 or 1968.5 model, Ford decided to call it the 1969 model. Shedding its Falcon roots, the second-generation Econoline became a heavier-duty vehicle, sharing many of its underpinnings with the F-Series full-size pickups. While the unibody construction of the previous generation van was carried over, a major change was made in the overall layout in the body and chassis of the Econoline. To build a heavier-duty chassis, the mid-engine forward-control layout was abandoned in favor of a front-engine layout with the axle placed forward; this also allowed the use of the “Twin I-Beam” front suspension used in the F-Series trucks. The redesign in the configuration resulted in major growth; the Econoline grew 15 inches in wheelbase; an 18-inch longer long-wheelbase model became the largest full-size van offered in North America at the time. As they had become introduced as options in Dodge and Chevrolet/GMC vans, Ford introduced a V8 engine option into the powertrain line. With the change of chassis and axle configurations, the Econoline gained a conventional hood for engine access (though most engine access remained from the interior). To aid in engine compartment ventilation, the model was given a conventional grille, styled similar to the F-Series. For 1971, the grille was redesigned to match the updated F-Series. For 1972, a sliding rear door became an option; introduced on a cutaway van chassis was the Hi-Cube van, a cab-chassis version of the Econoline with a box-van body. The introduction of the cab-chassis variant would become popular in the recreational-vehicle industry (a Class C RV), a segment still dominated by the E-Series in the 2010s. Inside of the Econoline, the shift of the engine location moved the engine housing from between the seats to in front of the driver and front passenger, under the windshield. While the Econoline cargo van remained, it was joined by an Econoline passenger van (replacing the Falcon van). To attract more buyers to passenger vans, Ford introduced two new trims of the passenger van, the Ford Club Wagon and Ford Club Wagon Chateau. Based on the long-wheelbase version, the Chateau had air conditioning, houndstooth fabric on all seats, an AM/FM sound system, and the option of 12-passenger seating. A new generation arrived in 1975, which would be produced until 1991. It was not just cars that reflected the American theme, as there was also a large grouping of motorcycles. Although American is perhaps best known now in motorcycle circles for the Harley Davidson, it was the Indian Motorcycle which was gathered here in some quantity. The Indian motorcycles were originally produced from 1901 to 1953 in Springfield, Massachusetts, In fact the company started out as the Hendee Manufacturing Company, but the name was changed to The Indian Motocycle Manufacturing Company in 1928. The Indian factory team took the first three places in the 1911 Isle of Man Tourist Trophy. During the 1910s, Indian became the largest manufacturer of motorcycles in the world. Indian’s most popular models were the Scout, made from 1920 to 1946, and the Chief, made from 1922 to 1953. Indian developed a model, the 841, for desert use by the US Army during the Second World War, but the brand was unable to unseat the dominance of Harley Davidson for general military use. In 1945, a group headed by Ralph B. Rogers purchased a controlling interest of the company. Under Rogers’ control, Indian discontinued the Scout and began to manufacture lightweight motorcycles such as the 149 Arrow, the Super Scout 249, both introduced in 1949, and the 250 Warrior, introduced in 1950. Production of traditional Indians was extremely limited in 1949, and no 1949 Chiefs are known to exist. All product manufacturing ended in 1953 as the Company was declared bankrupt. Various organizations have tried to perpetuate the Indian Brand name in subsequent years, with limited success. In 2011, Polaris Industries purchased Indian Motorcycles and moved operations from North Carolina and merged them into their existing facilities in Minnesota and Iowa. Since August 2013, Polaris have marketed three modern Indian motorcycles that reflect Indian’s traditional styling. This monster is an International Navistar CXT 7300, and it dates from 2005, though it would appear first to have been registered in the UK in January 2016. The International Extreme Truck Series (often identified by the acronym XT) is a range of pickup trucks produced by Navistar International from 2004 to 2008. Two vehicles were based on the International medium-duty truck range, while another was derived from a military tactical vehicle produced by Navistar. All of the XT-Series trucks were produced in Garland, Texas. The first vehicle marketed by International to consumers since the discontinuation of the Scout in 1980, the XT trucks marked the return of International to pickup truck production since the discontinuation of the 100-series pickups in 1975. The International CXT (Commercial Extreme Truck) is the first variant of the XT-Series to enter production, introduced in September 2004. At its launch, Navistar targeted the CXT towards business owners, marketing the truck as a dual-purpose vehicle. Along with putting it to use towing and hauling, the CXT could be put to use as a promotional vehicle, essentially as a large “rolling billboard”. Sharing a chassis with the International 7300 severe-service truck line (now known as the Workstar), the CXT was equipped with permanent four-wheel drive. Produced in either an extended-cab or four-door crew cab, the pickup truck bed was sourced from the dual rear-wheel Ford F-350 Super Duty (a hydraulic bed lift was offered as an option). Shared with the 7300 truck line, the CXT was equipped with a 220hp DT466 7.6 litre inline-6 turbodiesel, with a 300hp DT530 8.7 litre inline-6 turbodiesel becoming an option in 2005. Both engines were paired with a 5-speed Allison 2500HD automatic transmission. As with International medium-duty and severe-service trucks, the CXT was equipped with anti-lock air drum brakes. In contrast to the 7300, geared towards vocational customers, International designed the interior of the CXT with a number of luxury features. Materials for seats and other upholstery items included leather and ostrich skin. For the rear-seat passengers, options also included a DVD player and satellite radio. While the International CXT was not the longest pickup truck sold in North America, at 108 inches (to the top of the cab), it was the tallest (remaining so, as of the 2018 model year). At a curb weight of 14,500 lb (6,600 kg), it is (by far) the heaviest pickup truck ever sold in North America, weighing nearly twice as much as a Hummer H1 and nearly triple the weight of the 2004 Ford F-150. The 25,999 lb (11,793 kg) GVWR was deliberately specified by Navistar; the CXT cannot legally be driven without a commercial driver’s license if it were two pounds higher. In total, the CXT has a towing capacity of 20 tons. In response to lower than expected sales, Navistar discontinued production of the XT-Series in 2008. Even by American standards, this Continental Mark IV is a large car. Outside, that is. When you look inside, you can see that packaging efficiency as not one of the design priorities! Cars like this were known as a “personal luxury coupe”, and every manufacturer had an array of them in their range in the 1960s and 1970s. The Lincoln was designed to compete against the equally massive Cadillac Eldorado, and this particular version was sold from 1972 to 1976. Following the success of the Continental Mark III, the new Mark IV built upon the “long-hood, short deck” proportions with sharp-edged bumpers, hidden headlamps, and a tall, radiator-style grille. At the rear, the “Continental spare tyre trunk lid” made its return. However, as a cost-cutting move, the roofline of the Mark IV and the Thunderbird was a shared design, as indeed were the underpinnings. In a change from luxury-car tradition, the rear wheel openings were the same height as the front openings as they were on the Oldsmobile Toronado. All Mark IVs were equipped with a vinyl roof. The Mark IV introduced the opera window to the Mark series, a feature that would become a Mark trademark until 1984. In 1972, it was an almost universally specified option and from 1973 onward it was standard equipment. All Mark IVs were equipped with the 7.5 litre Ford 385 series V8 engine. 1972 Mark IV’s were rated at 365 bhp Gross, the engine being a direct carry-over from the previous Mark III. In 1973 the compression-ratio was lowered considerably due to new changing EPA requirements, and Ford adopted a new SAE method of measuring horsepower, resulting in 212 SAE net hp. The performance-gap between the 1972 and its later-year brethren was significant. All model years drove through a C6 3-speed automatic transmission. A feature retained from the Mark III was “Sure-track” brakes, which was one of the first American cars to become equipped with anti-lock brakes. Both front seats were power adjustable.In 1973, the federal requirement of 5 mph bumpers necessitated a redesign of the front grille; a year later, the rear bumper was redesigned with higher-mounted taillights. The Mark IV debuted a new tradition for the Mark Series, which later spread to other models in the Lincoln model range. Earlier, the Mark III had an Cartier-branded clock installed optionally. In 1976, the Designer Series was introduced as four special-edition models. Each edition was an option package with colour, trim, and interior choices specified by notable fashion designers (Bill Blass, Cartier, Givenchy, and Pucci). Each edition carried the designer’s signature on the opera windows and were fitted with a 22 karat gold-plated plaque on the instrument panel which could be engraved with the original owner’s name. The concept was successful and would continue on other Lincolns until the end of the 2003 model year. All Continental Mark IVs were assembled at the Wixom Assembly Plant in Wixom, Michigan, alongside the standard Lincoln Continental and the Ford Thunderbird. Nothing says US motorsport more than NASCAR, and this is an example of the current sort of entrant, this one a Toyota Camry, even if it bears no relation whatsoever to Toyota’s big-selling family sedan. This is the Penske PC22 Indy car Chassis #01 raced by Stefan Johansson to 11th place in the 1993 Indianapolis 500. It is one of eight cars built by Penske and was the team’s test car used by Emerson Fittipaldi and Paul Tracy. It is widely regarded as one of the classic Penske models of its era and is still fitted with its original Ilmor 265C engine giving around 790hp at 14,000rpm on methanol fuel. This is a 1953 Packard Clipper. It had originally been planned to introduce the new “Clipper” as a stand-alone marque, targeting the mid range price field which it was felt was dragging the Packard image down. When word was leaked to the Packard dealer network that they would be losing their best-selling Packard model to “Clipper”, they baulked. As an appeasement, the new 1953 Clipper was launched as a Packard, whilst work went on to transition the cars toward their own make. Thus, the Packard Clipper name was reintroduced and applied to the company’s entry-level models, previously known as the Packard 200, beginning in 1953. Clippers were available in Special and Deluxe trim models, as two- and four-door sedans. A 1953 Clipper went from 0 to 60 mph in 17.6 seconds in a Popular Mechanics test. The turning circle was 41 ft. For 1954, the “Clipper by Packard” was given its own unique rear fender trim and tail lights to further differentiate it from traditional Packards. The cars were also available with a distinctive two-tone paint pattern. For 1955, Packard became a marque in the newly formed Studebaker-Packard Corporation. The 1955 Clipper Custom offered torsion-bar suspension something not offered on other models, which only offered coil and leaf spring suspension. It also had a power steering option. Drivers enjoyed the comfortable ride but complained of door rattles and poor workmanship. The Packard Clipper Constellation was a two-door hardtop automobile produced by the Studebaker-Packard Corporation in model years 1955 and 1956. The 1955 model was a Packard product and sold as part of the Packard Clipper line; for 1956, Clipper split from Packard, becoming its own make. Older of two Plymouth models here was this 1939 Four Door De Luxe. While the original purpose of the Plymouth was to serve a lower-end marketing niche, during the Great Depression of the 1930s the division helped significantly in ensuring the survival of the Chrysler Corporation in a decade when many other car companies failed. Beginning in 1930, Plymouths were sold by all three Chrysler divisions (Chrysler, DeSoto, and Dodge). Plymouth sales were a bright spot during this dismal automotive period, and by 1931 Plymouth rose to number three in sales among all cars. In 1931 with the Model PA, the company introduced floating power and boasted, “The smoothness of an eight – the economy of a four.” In 1939, Plymouth produced 417,528 vehicles, of which 5,967 were two-door convertible coupes with rumble seats. The 1939 convertible coupe was prominently featured at Chrysler’s exhibit at the 1939 New York World’s Fair, advertised as the first mass-production convertible with a power folding top. It featured a 201 cu in, 82 hp version of the flathead six engine. Second Plymouth model here was a Duster 340, a semi-fastback two-door coupe version of the compact-sized Plymouth Valiant automobile that was marketed from 1970 to the 1976 model years, and which spawned a Dodge version, called the Demon. The Duster coupe provided the compact-sized Plymouth Valiant with a sporty body style to attract customers. The car was a $15 million effort to update the compact Valiant for the 1970 model year. The Valiant badge appeared only on the first model year Dusters, and continued to be used on all the companion 4-door sedan and 2-door Valiant Scamp hardtop models. The Duster was built on the Valiant platform and shared the same front end sheet metal, but featured a different design from the cowl back. The Duster was also positioned to compete with Ford’s slightly smaller semi-fastback Maverick compact car and the AMC Hornet that were both also introduced in 1970, and the slightly larger semi-fastback Chevrolet Nova whose design was introduced in 1968. While the Maverick and Nova were offered in a 4-door sedan body style, the Duster nameplate was used only for the 2-door coupe. The Duster was also marketed as an alternative to the original Volkswagen Beetle, as well as the new class of domestic subcompact cars such as the Chevrolet Vega. Numerous trim and option package variants of the Duster were offered with names that included Feather Duster, Gold Duster, Silver Duster, Space Duster, Duster Twister, Duster 340 and Duster 360. These marketing variations of the basic Duster design targeted customers seeking economy, cargo capacity, and/or performance. There were detailed changes every year, as was commonplace in America at the time. This is a 1973 model, with the 340 cubic inch (5.6 litre) engine, which was one down from the top of the range (that honour went to a 360 ci car). Older of the two Pontiac cars here was a rather nice Firebird TransAm. This model was introduced in 1967, at the same time as the Chevrolet Camaro, a car with which it shared its underpinnings. Although the bodystyles of the two cars were different in detail, the relationship remained obvious through the four generations of the model, and the two would evolve in parallel providing themselves as direct rivals to Ford’s Mustang, the car from which the pair took their inspiration. Earliest of the models here was a pre 74 car, one of the long-lived second generation models. The launch of these had been delayed until February 26, 1970, because of tooling and engineering problems; thus, the first cars are often known as 1970½ model, while leftover 1969s were listed in early Pontiac literature without a model-year identification. This generation of Firebirds were available in coupe form only; convertibles disappearing after the 1969 model year. Replacing the “Coke bottle” styling was a more “swoopy” body style, while still retaining some traditional elements. The top of the rear window line going almost straight down to the lip of the boot lid, a look that was to epitomise F-body styling for the longest period during the Firebird’s lifetime. The new design was initially characterised with a large C-pillar, until 1975 when the rear window was enlarged. There were two Ram Air 400 cu in (6.6 litre) engines for 1970: the 335 hp Ram Air III (366 hp in the GTO) and the 345 hp Ram Air IV (370 hp in the GTO) that were carried over from 1969. The difference between the GTO and Firebird engines was the secondary carburettor linkage which prevented the rear barrels from opening completely. Bending the linkage to allow full carburettor operation resulted in identical engine performance. The 455 engine available in the second generation Firebird Trans Am was arguably the last high-performance engine of the original muscle car generation. The 455 cu in (7.5 litre) engine made its first appearance in the Firebird in 1971 as the 455-HO, which continued through the 1972 model year. In 1973 and 1974, a special version of the 455, called the Super Duty 455 (SD-455), was offered. The SD-455 consisted of a strengthened cylinder block that included 4-bolt main bearings and added material in various locations for improved strength. Actual production cars yielded 1/4 mile results in the high 14 to 15.0 second/98 MPH range, results that are consistent with a 3,850 pound car (plus driver) and the rated 290 SAE net horsepower figure. An original rating of 310 SAE net horsepower had been assigned to the SD455, though that rating was based on an emissions non-compliant “pre-production” engine. That rating appeared in published 1973 model year Pontiac literature, which had been printed prior to the “pre-production” engines “barely passing*” emissions testing, and the last minute switch to what became the production engine During a 1972 strike, the Firebird (and the sister F-body Camaro) were nearly dropped, but fortunately the cars remained in production, though tightening restrictions on vehicle emissions had their effects on the available performance of the cars that would follow. The second car was one of the last ever GTOs. Enthusiasts will sometimes remind everyone that this is not a “real” GTO, as when it was relaunched in the U.S. market in 2004, it was in fact a rebadged, third-generation Holden Monaro. The VZ Monaro-based GTO was Pontiac’s first captive import since the 1988–1993 Pontiac LeMans. The V2/VZ Monaro was a 2-door coupe variant of the Australian developed VT/VX Holden Commodore. The Commodore had, in turn, been developed by enlarging the European designed 1994 Opel Omega B, which was marketed in its original form in the U.S. from 1997 to 2001 as the Cadillac Catera. The Monaro was also exported to the United Kingdom as the Vauxhall Monaro and to the Middle East as the Chevrolet Lumina SS. The revival of the GTO was prompted by former GM North America Chairman Bob Lutz, who had the idea of importing a Holden Commodore-based vehicle after reading a Car and Driver review of the Holden Commodore SS, published circa 2000. Car and Driver praised the performance of the V8 powered, rear-wheel drive Holden Commodore SS, but noted that even though it was one of the best vehicles that GM offered at the time, it could not be purchased in the United States. The idea of importing a rear-wheel drive Holden as a GM North American performance offering gradually transformed into importing the Monaro. Lutz, as well as other GM executives, later drove a Holden Monaro while on a business trip in Australia, which convinced them that importing the car could be a profitable venture. Lutz had to convince GM executive hierarchy to import the car, and overcome a corporate culture that promoted regional autonomy between GM North America and its overseas divisions. This resulted in an “unnecessarily long gestation period,” as Lutz put it, and at a much higher cost than anticipated. The Monaro design was introduced in 2001, but appeared “dated” in 2004 when it was released in the United States. It was also originally planned to sell for about $25,000, but by the time it was launched in the U.S., the Australian dollar’s growth against the U.S. dollar had inflated the price of the car to well over $34,000. Both of these elements played a role in the car’s lukewarm acceptance by the general public. The GTO was assembled by GM’s Holden subsidiary at Elizabeth. It was equipped with the 5.7 litre LS1 V8 engine for the 2004 model year, the same engine found in the concurrent model year Chevrolet Corvette, with a choice of a 6-speed manual transmission or a 4-speed automatic. Changes from the Australian-built Monaro included bracing additions to the body to meet U.S. crash standards, a “corporate Pontiac” front facia, new badging, “GTO” stitching on the front seats, and a revised exhaust system. GM Engineers benchmarked the sound of the 1964 GTO held in the Pontiac historical collection, as well as other LS1-powered vehicles, while working with the exhaust vendor to tune the system. The effort was made to make the new GTO invoke the same sound as the original while still meeting the noise threshold required by some states. The 2004 GTO exhaust was a true dual system that followed the original Monaro exhaust routing, thus both tailpipes exited on the driver side of the vehicle. General Motors claimed performance of 5.3 seconds to 60 and a 13.8 second quarter mile time, which was closely verified by several magazine tests. Initially in 2004, the car was offered in several colors: Barbados Blue Metallic, Cosmos Purple Metallic, Quicksilver Metallic, Phantom Black Metallic, Impulse Blue Metallic, Torrid Red, and Yellow Jacket. GM had high expectations to sell 18,000 units, but the Monaro-based GTO received a lukewarm reception in the U.S. The styling was frequently derided by critics as being too “conservative” and “anonymous” to befit either the GTO heritage or the current car’s performance. Given the newly revived muscle car climate, it was also overshadowed by the Chevrolet Monte Carlo, Chrysler 300, Dodge Charger, Dodge Magnum, and the new Ford Mustang, which all featured more traditional “muscle” aesthetics. Critics also pointed out the car’s high sale price. Sales were also limited because of dealer tactics, such as initially charging large markups and denying requests for test drives of the vehicle. By the end of the year, the 2004 vehicles were selling with significant discounts. Sales were 13,569 of the 15,728 imported cars for 2004. The bonnet scoops that originally were slated for production in 2005 were pushed into production as part of an over-the-counter Sport Appearance Package. The 2004 Sport Appearance Package also included a taller and more angular rear spoiler, as well as deeper inset grilles. On February 21, 2006, Buick-Pontiac-GMC General Manager John Larson announced to dealers that GM would halt imports of the GTO in September, making 2006 the last model year for the new GTO. The explanation was the inability to meet new airbag deployment standards for 2007. The final production numbers of the 2006 Pontiac GTO are 13,948 cars, an increase from 11,069 from the previous model year. The last Pontiac GTO, which was also the very last Monaro-based coupe produced, came off the assembly line in Australia on June 14, 2006. Total production for all three years was 40,808 vehicles. 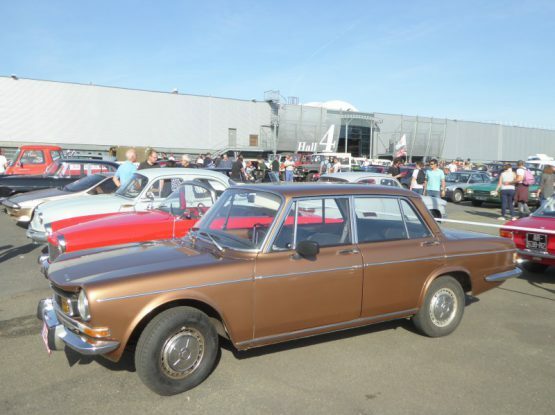 I first saw this 1963 Rambler 990 Ambassador at the event last year, and here it was again, making another appearance. The Ambassador was the top-of-the-line automobile produced by the American Motors Corporation (AMC) from 1958 until 1974. The vehicle was known as the AMC Ambassador, Ambassador V-8 by Rambler, and Rambler Ambassador at various times during its tenure in production. Previously, the name Ambassador had applied to Nash’s “senior” full-size cars and indeed the Ambassador nameplate was used continuously from 1927 until 1974 (the name being a top-level trim line between 1927 and 1931); at the time it was discontinued, Ambassador was the longest continuously used nameplate in automotive history. The car seen here was the fourth generation of the Rambler-badged cars to bear the name. In 1962 Romney had left AMC to run for Governor of Michigan, a position that he won. The automaker’s new president, Roy Abernethy, who was responsible for the increasing sales under Romney, reacted to the mounting competition (in 1963 AMC built as many cars as they had in 1960, but overall total car sales had increased so much that it gave AMC only sixth place in production; the same output in 1960 had put them third) in a logical way: “Let’s get rid of this Romney image.” A completely redesigned larger Rambler line-up appeared. The new cars continued the philosophy in building smaller cars than its larger “Big Three” competitors that also had a high degree of interchangeability in parts to keep tooling costs and production complexity to a minimum. The company, which pioneered “styling continuity”, introduced all-new styling for the 1963 model year Ambassadors and claimed that these were “functional changes …. not change just for the sake of change.” The Ambassadors featured a 4-inch longer wheelbase, but were 1.2-inch shorter due to reduced front and rear body overhangs, as well as a 3-inch drop in over-all height. Designed by Richard A. Teague, the 1963 Ambassador’s shape was much tighter, cleaner, and smoother, with almost all of its parts interchangeable between it and the new Classic. All Ambassadors used unitised structure instead of the more rattle-prone, traditional body-on-frame construction which was still the industry standard. In 1963, AMC’s new 112 in wheelbase cars (Ambassadors and Classics) used a revolutionary method of unit construction which has since been almost universally adopted by automobile manufacturers. AMC Ambassador and Classics used outerpanels stamped from single sheet metal panels which included both door frames and outer rocker panels. This resulted in an extremely rigid and rattle-free structure, better fit of doors into frames, production cost savings and reduced noise, vibration and harshness. The “uniside” structure was superior to the conventional production methods in which multiple smaller pieces were welded together. There were 30% fewer parts and the result was greater structural rigidity, quieter car operation, and an over-all weight reduction of about 150 pounds. Curved side glass and push-button door handles were new and costly upgrades, but contributed to the new Rambler’s handsome, elegant, and modern Mercedes-like bodyside styling, by adding greater elegance in detail. At the time, curved side glass was used only in much more expensive luxury cars, but increased interior room and visibility, as well as reducing wind noise and improved proportions and styling of the cars. The Ambassador also featured a squared-off Thunderbird-type roofline. The front end featured a forward-thrusting upper and lower ends with a vertical bar “electric shaver” chrome grille insert. The Ambassador’s grille was differentiated from the Classic’s grille by its use of the Ambassador name in script in the small horizontal bar between the upper and lower grille sections. Round quad headlights were slightly recessed in chrome bezels mounted side-by-side within the grille at its outermost edges. Overall, the new Ambassadors were described by the staff of Automotive Fleet magazine as “probably the finest looking cars ever produced by American Motors.” Ambassadors once again came in 2-door coupe, 4-door sedan, and 4-door wagon body styles, but new trim lines debuted. A “Mercedes-like three-number model designation was developed” with the 800 as the Ambassador’s base line (replacing the previous year’s Super model) for the police, taxi, and fleet market, a 880 model (in place of the Custom), and the up level 990 trim (replacing the previous 400 models). The 1963 Ambassadors were offered only with the 327 cu in (5.4 litre) V8, in either 250 hp 2-barrel or 270 hp 4-barrel versions. AMC’s smaller 287 cu in (4.7 litre) V8 engine was only offered in the Classic line. The automatic transmission was controlled by a steering column mounted lever, replacing the previous pushbutton system. Maintenance was reduced with service intervals of the front wheel bearings increased from 12,000–25,000 miles, the recommended engine oil change was at 4,000 miles, and all Ambassador models included an alternator and an electronic voltage regulator as standard equipment. Sales were brisk, and the redesign was billed a success, with Motor Trend Magazine bestowing Car of the Year status on the entire 1963 Rambler line, including the Ambassador. The marketing formula for the Ambassador generated record sales for the model with buyers favoring more luxury and features as evidenced by the Ambassador 990 models outselling the 880 versions by nearly 2-to-1, while the base 800 model had a total of only 43 two-door sedans built. The automaker did not have the resources of GM, Ford, and Chrysler, nor the sales volume to spread out its new model tooling and advertising costs over large production volumes; however, Richard Teague “turned these economical cars into smooth, streamlined beauties with tons of options and V-8 pep.” The 1964 model year introduced minor trim changes and new options. The “electric-shaver” grille on the 1963 model was replaced with a flush-mounted design, and the engine and transmission options were widened. A two-door hardtop body style called 990-H was added for the first time since 1957. Base 880 and the 880 models were dropped from the line. The 1964 Ambassadors featured the 250 hp 2-barrel 327 cu in (5.4 litre) V8 as standard, with the 4-barrel 270 hp version as optional. The automaker did not offer a 4-speed manual transmission to compete with the sporty mid-size V8 offerings from Ford or GM. Instead, AMC offered its innovative “Twin-Stick” manual transmission. The “Twin stick” option consisted a three-speed manual transmission, operated by one of the two console mounted “sticks” in conjunction with an overdrive unit that was controlled by the second “stick” in both 2nd and 3rd gears. This gave the driver the option of using five forward gears. One magazine noted the Twin-Stick, 270 hp Ambassador was heading for a sub 16-second quarter-mile when they blew up the clutch. A new generation 990 model was introduced for 1965. Once again, there was one of the intriguing Stanley Steam Cars here. These are always popular with the crowds, and are spectacular to watch as they set off up the hill, which this one did in the lunchtime cavalcade. Despite what you might think, you can actually get up a head of steam quite quickly, so they don’t take as much preparation as you might imagine but the real problem is range. At a previous event, I chatted to the owner of one of these cars, and he said that you are limited to about 20 – 30 miles, before you have used all the gasoline on board which is burned to generate the heat to produce the steam. The Stanley Motor Carriage Company was an American manufacturer of steam-engine vehicles, operating from 1902 to 1924, with the cars colloquially called Stanley Steamers. Several different models were produced. Early Stanley cars had light wooden bodies mounted on tubular steel frames by means of full-elliptic springs. Steam was generated in a vertical fire-tube boiler, mounted beneath the seat, with a vaporising gasoline (later, kerosene) burner underneath. The boiler was reinforced by several layers of piano wire wound around it, which gave it a strong, yet relatively light-weight, shell. In early models, the vertical fire-tubes were made of copper, and were expanded into holes in the upper and lower crown sheets. In later models, the installation of a condenser caused oil-fouling of the expansion joints, and welded steel fire-tubes were used instead. The boilers were safer than one might expect – they were fitted with safety valves, and even if these failed, a dangerous overpressure would rupture one of the many joints long before the boiler shell was in danger of bursting, and the resulting leak would relieve the boiler pressure and douse the burner with little risk to the occupants of the car. There has never been a documented case of a Stanley boiler exploding in use. The engine had two double-acting cylinders side-by-side, equipped with slide-valves, and was of the simple-expansion type. Drive was transmitted directly from the engine crankshaft to a rear-mounted differential by means of a chain. Locomobiles were often modified by their owners, who added third-party accessories, e.g. improved lubricators, condensers, and devices which mitigated the laborious starting procedure, and so forth. Later, the Stanley brothers, to overcome patent difficulties with the design they had sold to Locomobile, developed a new automobile model with twin-cylinder engines geared directly to the back axle. Later models had aluminium coachwork that resembled internal combustion cars of the time but retained the many steam-car features such as no transmission, clutch, or driveshaft. They also had a fully sprung tubular steel frame. When they later shifted the steam boiler to the front of the vehicle, the resulting feature was called by owners the “coffin nose.” The compact engine ran at considerable steam pressure, with the 10HP boiler described in 1912 as having the safety valve set at “650 pounds” (psi), with the burner set to automatically cut back when pressure reached “500 pounds”. The twin cylinder steam engines were at that time 10HP, with 3.25″ bore and 4.25″ stroke, and 20HP with 4″ bore and 5″ stroke, and made extensive use of ball bearings. In order to improve range, condensers were added from 1915. A Stanley Steamer set the world record for the fastest mile in an automobile, 28.2 seconds, in 1906. This record was not broken by any automobile until 1911, although Glen Curtiss beat the record in 1907 with a V-8 powered motorcycle at 136 mph (219 km/h). The record for steam-powered automobiles was not broken until 2009. Production rose to 500 cars in 1917, but by the early 20s, the limited range proved too limiting, so the concept was dead and production ceased. In 1947, Studebaker completely redesigned the Champion and the Commander, making them the first new cars after World War II. The styling included new rear window, flat front bumpers, as well as convenience features like back light illumination for gauges and automatic courtesy lights. The 2.8 litre inline 6 engine produced 80 hp. The Champion made up 65.08% of the total sales for the automaker in 1947. In 1950, output was increased to 85 hp and some new styling arrived, with a new grille, sheet metal, and at the rear end, as mechanically, an automatic transmission was now offered. One of the new styling features on the cars was the wraparound, “greenhouse” rear window that was on 2-door cars from 1947–1951, at first just an option, but in 1950 it was given its own trim line, the Starlight coupe. The “spinner” grille was introduced in 1950, similar to that of a Ford Deluxe, but was dropped again for the 1952 model year. This bright orange car – which is often to be seen here and at other venues in the south west – is accordingly a 1951 Starlight Coupe. The Studebaker Lark is a compact car which was produced by Studebaker from 1959 to 1966. Lark-based variants represented the bulk of the range produced by Studebaker after 1958 and sold in far greater volume than the contemporary Hawk and Avanti models. Beginning with the 1963 Cruiser, the Lark name was gradually phased out of the company catalogue and by early 1964, Lark-based models were being marketed under Commander, Daytona and Cruiser nameplates only. At the time the Lark was conceived, Studebaker-Packard Corporation was under a management contract with Curtiss-Wright Aircraft Company. Studebaker-Packard had been losing money for a few years when company president Harold E. Churchill came up with the idea of abandoning the full-size car market in favour of building a new compact car that he hoped would save the company. The Lark was ingeniously designed around the core bodyshell of the full-sized 1953–1958 Studebakers. By reducing the front and rear overhangs and shortening the wheelbase ahead of the firewall, the car could still seat six people comfortably and hold a surprising amount of luggage. It was hoped that the new model would save America’s oldest vehicle manufacturer when it was launched in the fall of 1958 as a 1959 model, much like the 1939 Studebaker Champion had saved the company in the years prior to World War II. In fact, it was the Champion which Churchill specifically took as his inspiration for the Lark. Two series of Larks were available, the Lark VI and the Lark VIII, both designations indicated engine type of the cars. Both series were available in “Deluxe” and “Regal” trim levels. With its simple grille, minimal and tasteful use of chrome and clean lines, the Lark “flew” in the face of most of the established “longer, lower and wider” styling norms fostered by Detroit’s “Big Three” automakers (General Motors, Ford, and Chrysler). Studebaker’s 1957-58 Scotsman had proved the existence of a demand for a less-flashy automobile, and while the Lark was not nearly so undecorated as the Scotsman, it was unmistakably purer of line than anything Detroit would offer for 1959, save the Rambler American. Sales of the Lark were good for the 1959 and 1960 model year, thanks to the fact that Studebaker had obtained “dual” dealerships with dealers of the Big Three manufacturers that did not as yet have their own compacts to sell. Initial models included two- and four-door sedans, a two-door hardtop coupe and a two-door station wagon, with two levels of trim (Deluxe and Regal) offered on most. Aside from American Motors Corporation’s Rambler line, the Lark offered the broadest line of compacts on the U.S. market. Indeed, the Lark was the first car of its size to offer a V8 engine — the slightly smaller Rambler American offered only an inline six, though the slightly larger Rambler Rebel did offer a V8 close to the same size as Studebaker’s. The lineup grew for 1960, when the company introduced a convertible (Studebaker’s first since 1952) and a four-door station wagon. Two-door wagons were fast falling from favor throughout the industry, despite a minor redesign which made the two-door Lark wagon’s tailgate and rear side windows more user-friendly, and indeed the four-door quickly proved the more popular of the two available wagons from Studebaker. A taxicab version of the Lark, originally called the “Econ-O-Miler,” was built on the station wagon’s longer 113 in wheelbase. The extra 4.5 in of wheelbase translated into extra rear seat legroom, which was important in the taxi trade. For 1959 and 1960, Larks were available with either an L-head (flathead) 2.8 litre six-cylinder engine or the company’s 4.2 ltire V8. Testers at the time gave high marks to the V8’s performance. A V8 Lark could turn out a 0 to 60 mph time of around 10 seconds, which was on par with much larger cars. By comparison, among the early Big Three compacts (Ford Falcon, Mercury Comet, Chevrolet Corvair and Plymouth Valiant) that arrived on the scene in 1960, only the Valiant could break the 20-second mark from 0-60 mph. None of the Big Three compacts offered a V8 until the second wave of such cars — the so-called “senior compacts” — arrived for 1961. To meet the challenge of those new cars head-on, for 1961 Studebaker created a new four-door sedan, the Cruiser, using the Econ-O-Miler taxicab body with an upgraded, more luxurious interior. The resulting car harked back to the long-wheelbase Studebaker Land Cruiser sedans of the late Forties and early Fifties. These cars can be distinguished from their lesser four-door counterparts by the 1959-60-style roofline and operational vent windows in the rear doors, while other sedans used one-piece glass in the rear doors. A new option, a canvas-covered folding sunroof dubbed the “Skytop” was introduced as an extra-cost feature for sedans and the two-door hardtop. A mild restyling, too, was carried out. Non-Cruiser sedans and the two-door hardtop received a squared-off roofline, and a new front end design gave the Lark a broader grille and the availability of quad headlamps (as standard equipment on Regal and Cruiser models, optional on Deluxes). Although the styling was modified, engineering enhancements were the big news for 1961, as the Larks received a performance boost. Studebaker advertised as “the compact with Performability,” and this was abetted by the addition of the 4.7 litre V8 from the Hawk family sports car as an option, although this was mainly for Larks intended for police pursuit packages. The bigger news, as far as the general public was concerned, involved the six-cylinder engine. Studebaker’s engineers had long known that their little flathead mill, which dated in its basic form to 1939, was falling farther and farther behind the competition in both power and fuel economy. Lacking the budget to design a completely new engine, the engineering staff converted the 170 engine to overhead valves while retaining much of the basic design. The “new” six, which displaced the same 170 cu. in. as before, went from 90 hp to 112 hp, all without a loss in fuel economy. Indeed, most road testers of the day found the new engine to be easier on fuel than the flathead, and cars so equipped were able to shave nearly four seconds off the all-important 0-60 mph time. The redesigned six, known as the “Skybolt Six,” was marketed by Studebaker extensively in 1961. Other engineering improvements that modernised the 1961 Larks included the introduction of cowl ventilation, suspended brake and clutch pedals (accompanied by a firewall-mounted brake master cylinder) and revamped steering systems. Unfortunately, for all of its new engineering and the mild restyling, sales of the Lark dropped off precipitously for 1961. Even more new competitors were squeezing their way into the marketplace, as Dodge brought out the Lancer, and General Motors issued the Buick Special, Oldsmobile F-85 and Pontiac Tempest. These new “senior compacts,” in addition to their very presence in the market, caused other problems for Studebaker. Most of the Big Three dealers who had signed on with the independent when the Lark debuted dropped the smaller company under pressure from the Detroit manufacturers once the new cars broke cover. Those who did not drop Studebaker outright often put more effort to selling their other product lines. A heavily revamped version was produced for 1962. In the paddock with the American cars was this Ultima. And yes, I am sure everyone knows that it is not technically American, as it is manufactured by Ultima Sports Ltd of Hinckley, Leicestershire, England. However, as many of them have American BV8 engines to power them, then it qualifies sufficiently to join the display. The Ultima is available both in kit form and as a “turnkey” (i.e. assembled by the factory) vehicle. The design is a mid engined, rear wheel drive layout, with a tubular steel space frame chassis and GRP bodywork. Both close coupe and convertible versions have been made. The latter is called the Ultima Can-Am. Kit builders are free to source and fit a variety of engines and transmissions but the Chevrolet small block V8 supplied by American Speed mated to either a Porsche or Getrag transaxle is the factory recommended standard, and this configuration is fitted to all turnkey cars. There were a couple of Willys Jeeps here. Back, so the organisers said, by popular demand, was the oldest surviving Wall of Death, The Demon Drome. which was once again in the corner of the Orchard. This is the original 1920s motordrome where daredevil riders defy gravity and perform the craziest of feats with their Indian motorcycles – just inches from your eyes. I’ve watched the spectacle before at this venue, and never cease to be amazed. It is a most impressive show and well worth seeing, though as the structure flexes somewhat, it is hard to keep still enough to get decent photos, as I have found out on previous occasions. The Drome goes back to the early part of the 1900’s when the sport of board track racing started to become very popular in the United States. Mile long raceways were constructed out of wood. Long straights and banked turns allowed riders to reach awesome speeds, fighting and risking everything for the win. After too many fatalities, the sport was banned. But the racers needed a new challenge. By eliminating the straights and making the wooden track 90 degrees perpendicular to the ground they started to entertain the public and a new attraction was born, ‘The Wall of Death’. This particular one, the Demon Drome, which measures 30 foot high, is believed to have been constructed in 1927 and shipped over to the UK not long after by Pat Collins Funfairs. His son in law, Elias Harris then took it on. Elias built a car, powered by an Indian four engine, which had a special platform for his Lioness “Rita”. The wall of death was sold to Roy Cripsey where it was thought to be the first wall to have a go-kart ridden around it. It was erected at Skegness and was kept there till the early 80’s. When Alan Ford bought the wall of death he re-branded it the “Motordrome co.” Alan travelled the wall until 2000, then it was stored on the back of a lorry in Kent and left to rot. In 2003 the current owners bought it and began a three-year restoration project. Not only has the wall been given a well needed make over, it has given it a new sense of direction, bringing the act into the twenty-first century. Indian Scout motorcycles are still used, though, and there is a small car which is part of the act. The popular stilt-walkers made another appearance here, and they seemed to roam quite widely around the site, finding it no hardship to move around, surprisingly briskly when they wanted to do so. The duo on stilts seem to manage a transition from fake French policemen, which is their role at the La Vie en Bleu event, to full-blooded Yanks quite easily. Adjacent to the Demon Drome was a stage, which played host to a number of different acts during the weekend. The ‘Hot Rockin’ main stage played host to non-stop live music bands throughout the weekend and featured the talented Ding Dong Daddios, the resident band of choice for Goodwood Revival. The 5 sharply dressed nimble guys are simply the ‘kings of swing!’ performing an infectious blend of Jump Jive and Swing with a hint of early rock and roll. Jon Clare and The Fabulous Doughboys made their Prescott debut, the bands dynamic piano, bass and drums line-up really packs a punch. They drew on classic songs from the 1950s and gave them the powerhouse piano treatment – just think Jerry Lee Lewis, but we will give the Balls of Fire a miss being a motor sport venue! Plus there was also the marvellous songstress Betsy Harmony and the return of the popular Lady & The Sax–their stage presence providing a hugely entertaining high octane show. For those who wanted to join in, there was a dance floor created on the grass right by the stage, and there were plenty of people seemingly eager to show off their skills. As well as the American theme, there is a full program of hill-climbing that takes place over the weekend. All manner of different cars are entered, making for plenty of variety. These are just some of the entrants on the Saturday. This Abarth 500, driven by father and son, Peter and James Fletcher, is a regular at Prescott, and is often to be seen putting in some very impressive times. A familiar sight at Prescott is this Piccard Pictet. This is a Swiss car, manufactured in Geneva from 1906 to 1924. They were produced by the Piccard-Pictet Company until 1920, and by Gnome et Rhône from 1920 until the demise of the marque in 1924. At the beginning of the 20th century two brothers, Charles and Frederic Dufaux, set about building their own race car. The design called for a straight-8 12-litre engine with about 80 horsepower. To produce the automobile, the two brothers contacted the Piccard-Pictet Company, which had the capability to manufacture such a vehicle. The elderly Paul Piccard did not think highly of the relatively new invention of the automobile. On the other hand, Lucien Pictet thought cars had a bright future. This friction led to the founding of the Société d’Automobiles, Geneva (S.A.G.) in 1905. This was a marketing company that contracted with Piccard-Pictet Company to manufacture the automobiles. In fact, the cars were known as SAGs until 1910. Lucien Pictet was appointed managing director. Léon Dufour was appointed chief designer, and later added technical director to his job titles. Pictet traveled to Barcelona in early 1905, and while there met with fellow Swiss Marc Birkigt of Hispano-Suiza. Pictet was so enamored of the Hispano-Suizas that he negotiated a licence agreement in August 1905. At the second annual International Geneva Motor Show in 1906, Piccard-Pictet/S.A.G. displayed a 20/24 horsepower licensed Hispano-Suiza. In 1907, a 6-cylinder 28/32 horsepower car was introduced. In 1910, a 14/16 horsepower 2.4 litre 4-cylinder car was added. During World War I, the Swiss Army ordered a large number of Pic-Pics, which were known for their robustness. Indeed, these cars were in use until the late 1930s. The two post-war models used either a 2.9 litre 4-cylinder or a 5.9 litre V8. Sales of the cars declined after the war due to competition from imported brands. This led Piccard-Pictet Company to file for bankruptcy in 1920. Henceforth, Gnome et Rhône produced Pic-Pic cars, the last one being presented at the 1924 International Geneva Motor Show. In 1916 Commandant Yves le Prieur, a naval officer, used a Pic-Pic to demonstrate the safety and effectiveness of the Le Prieur rocket. The Pic-Pic’s ability to travel up to 80 Mph simulated the speed of the aircraft of the time. The successful test led to the use of LePrieur’s rockets on Nieuport fighter aircraft against German balloon aircraft. Pic-Pics competed in a number of motorsports in their short existence. Two Pic-Pics with 4.5 litre engines and front wheel brakes competed in the 1914 Grand Prix, but both cars were withdrawn. In hillclimbing events, Pic-Pics competed more successfully. Pic-Pic cars came in first place in Vosges in 1909, Bern in 1911, and Jaunpass in 1912, 1913, and 1914. Perhaps the least familiar entrant was this. Saker Sports Cars were designed and built in Feilding, New Zealand by Bruce Turnbull of Turnbull Engineering from 1989 to 2002. Turnbull has been providing technical assistance in the development of the Hulme F1. The Saker SV1 was the first model of the car, which was road legal and regularly used for touring and competition. The SV1 was designed to be powered by a variety of engines, including V8 and V6. They were sold in the UK, Japan and New Zealand. In 1999 Turnbull introduced the Saker SVS GT and SVS Sprint. The Sprint was an open-top version. These model features updated chassis and mechanics. The main changes were to the space-fame chassis, to allow it to accept boxer type 4 or 6 cylinder engines. The most common engine used was the Subaru Impreza WRX turbo 4 and 2 wheel drive, converted transaxle. Both the GT and Sprint were manufactured in the Netherlands, though there was a dispute over the licensing. A small number (believed to be around 3) of race-only Saker GTs were also manufactured under license in the USA. One road-going Saker SVS was imported from New Zealand into the USA in 2004. It was fitted with a Lexus 1UZ-FE 4.0-litre V8 engine mated to a Renault UN1 5-speed Transaxle. Since then it has undergone surgery to accept a highly modified Chevy LS6 5.7L V8 that is just shy of 500bhp mated to an Audi 01E (DQS variant) 6-speed transaxle. At the time of the engine change the owner also modified the body, headlights, tail lights, and front bumper/splitter to make the car look more modern. In 2002 Huub Vermeulen (DNRT) and Robbert Visser were wanting to make an affordable racing car. Bruce Turnbull’s Saker appeared to meet that need. The rights to manufacture the cars were purchased and Saker Sportscars was founded in the Netherlands. The company is now run by Herbert Boender with the support of the Meyer brothers, Laurens and Gerrit. Both the Saker GT and Sprint are still made by Saker Sportscars. In 2010 two new versions were added to the range, the RapX and the Sniper. However, the specifications remain the same as the GT and Sprint with only the bodywork changing. There was a whole class of Triumphs. Most of the entered cars were TR models, with examples ranging from the TR3b, through several TR6s, to a couple of TR7 models, one rather more modified than the other, but there were other models entered as well, including Dolomites, Spitfires and a Vitesse. There were a couple of Volvo 122 models entered. Local dealer Porsche of Tewkesbury have been sponsors of Prescott for a few years now, and accordingly, they bring along a small display unit and a representative sample of the latest cars, most of which they leave open for attendees to have a look at. In many cases, when a family with children are among those having a close inspection, it is the excited children that want to clambour in and out and their parents happily take photos, so I was quite amused when the reverse happened, with one lady almost pushing her way into the driving seat of model after model and getting her young children to take photos of her! Models on display ranged from the SUV Macan and Cayenne, to the 911 and 718 Cayman sports cars as well as one of the latest second generation Panamera executive saloons. As with any event at Prescott, and indeed plenty of other venues, it is always worth a good look around the public car park. There is not quite the same pressure on space at the Autumn Classic as can be the case at some of the busiest Prescott events, and with the weather clearly putting some people off from coming altogether, it meant that there were not huge numbers of cars of any sort in the adjoining field, but there were enough for it to be necessary to wander up and down the rows to see what was hidden from view until you were close on it, and combining what I found with the more interesting cars that were more conspicuous in the Orchard, there was still plenty of interest. There’s nearly always at least one Abarth 500-based model in the car parks of Prescott whenever I come, and on most occasions it tends to be one that I don’t recognise from the ever-growing numbers of Abarth Owners Club members. That proved to be the case once again here with a nice 595 parked towards the bottom of the field. This time there was also a 124 Spider, again a car whose owner is unknown to me. This AlfaSud Sprint is something of a regular at the venue, and it is always nice to see this very elegant car. There was a much longer wait for a Coupe version of the AlfaSud than there had been for the larger Alfetta, the Alfasud Sprint being presented to the press in September 1976 in Baia Domizia and shown at the Turin Motor Show in November some five years after the launch of the saloon. Designed by Giorgetto Giugiaro like the AlfaSud, whose mechanicals it was based on, it had a lower, more angular design, featuring a hatchback, although there were no folding rear seats. The AlfaSud Sprint was assembled together with the AlfaSud in the Pomigliano d’Arco plant, located in southern Italy—hence the original “Sud” moniker. Under the Alfasud Sprint’s bonnet there was a new version of the AlfaSud’s 1186 cc four-cylinder boxer engine, stroked to displace 1,286 cc, fed by a twin-choke carburettor and developing 75 hp at 6,000 rpm. Mated to the flat-four was a five-speed, all-synchromesh gearbox. The interior was upholstered in dark brown Texalfa leatherette and tartan cloth. Options were limited to alloy wheels, a quartz clock and metallic paint. In May 1978 the AlfaSud Sprint underwent its first updates, both cosmetic and technical. Engine choice was enlarged to two boxers, shared with the renewed AlfaSud ti, a 78 hp 1.3 (1,350 cc) and a 84 hp 1.5 (1,490 cc); the earlier 1286 cc unit was not offered anymore, remaining exclusive to the AlfaSud. Outside many exterior details were changed from chrome to matte black stainless steel or plastic, such as the wing mirrors, window surrounds and C-pillar ornaments; the B-pillar also received a black finish, the side repeaters changed position and became square, and the front turn signals switched from white to amber lenses. In the cabin the seats had more pronounced bolsters and were upholstered in a new camel-coloured fabric. Just one year later, in June 1979, another engine update arrived and the AlfaSud Sprint became the AlfaSud Sprint Veloce. Thanks to double twin-choke carburettors (each choke feeding a single cylinder) and a higher compression ratio engine output increased to 85 hp and 94 hp, respectively for the 1.3 and 1.5. In February 1983 Alfa Romeo updated all of its sports cars; the Sprint received a major facelift. Thereafter the AlfaSud prefix and Veloce suffix were abandoned, and the car was known as Alfa Romeo Sprint; this also in view of the release of the Alfa Romeo 33, which a few months later replaced the AlfaSud family hatchback. The Sprint also received a platform upgrade, which was now the same as that of the Alfa Romeo 33; this entailed modified front suspension, brakes mounted in the wheels instead of inboard like on the AlfaSud, and drum brakes at the rear end. Three models made up the Sprint range: 1.3 and 1.5, with engines and performance unchanged from the AlfaSud Sprint Veloce, and the new 1.5 Quadrifoglio Verde—1.5 Cloverleaf in the UK. A multitude of changes were involved in the stylistic refresh; there were a new grille, headlamps, wing mirrors, window surrounds and C-pillar ornaments. Bumpers went from chrome to plastic, and large plastic protective strips were added to the body sides; both sported coloured piping, which was grey for 1.3 cars, red for the 1.5 and green for the 1.5 Quadrifoglio. At the rear new trapezoidal tail light assemblies were pieced together with the license plate holder by a black plastic fascia, topped by an Alfa Romeo badge—never present on the AlfaSud Sprint. In the cabin there were new seats with cloth seating surfaces and Texalfa backs, a new steering wheel and changes to elements of the dashboard and door panels. Sprint 1.3 and 1.5 came with steel wheels with black hubcaps from the AlfaSud ti. The newly introduced 1.5 Quadrifoglio Verde sport variant was shown at the March 1983 Geneva Motor Show. Its engine was the 1,490 cc boxer, revised to put out 104 hp at 6,000 rpm; front brake discs were vented and the gearing shorter. In addition to the green bumper piping, also specific to the Quadrifoglio were a green instead of chrome scudetto in the front grille, a rear spoiler and 8-hole grey painted alloy wheels with metric Michelin TRX 190/55 tyres. Inside a three-spoke leather-covered steering wheel, green carpets and sport seats in black cloth with green embroidery. In November 1987 the Sprint was updated for the last time; the 1.3 variant was carried over, while the 1.5 engine was phased out and the 1.5 QV was superseded by the 116 hp Sprint 1.7 Quadrifoglio Verde. The 1,286 cc engine was directly derived from the 33 1.7 Quadrifoglio Verde, and could propel the Sprint from 0 to 100 km/h in 9.3 seconds; to cope with the increased engine power, the 1.7 QV adopted vented brake discs upfront. the coloured piping and side plastic strips were deleted, and the Quadrifoglio had alloy wheels of a new design. A fuel injected and 3-way Catalytic converter-equipped 1.7 variant, with an engine again derived from a 33, was added later for sale in specific markets. There were a total of 116,552 Sprints produced during its lifespan, which lasted from 1976 to 1989. 15 of these formed the basis of the Australian-built Giocattolo sports car, which used a mid-mounted Holden 5.0 group A V8 engine. The Sprint had no direct predecessor or successor. The car seen here, another stalwart of Prescott, is one of the earlier models with the chrome bumpers. First seen as a concept at the 2011 Geneva Show, the production 4C Competizione model did not debut for a further 2 years. Production got underway later that year at the Maserati plant in Modena, and the first deliveries were late in 2013. 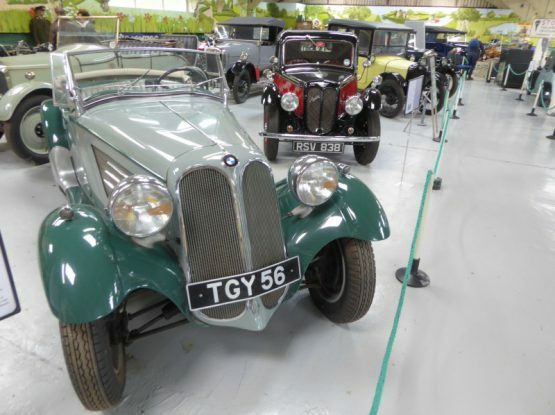 Production was originally pegged at 1000 cars a year and a total of just 3500, which encouraged many speculators to put their name down in the hope of making a sizeable profit on selling their cars on. That plan backfired, and in the early months, there were lots of cars for sale for greater than list price. Press reaction to the car has been mixed, with everyone loving the looks, but most of them feeling that the driving experience is not as they would want. Owners generally disagree – as is so often the case! For sure, it has no radio, and no carpets and no luggage space to speak of, but you know that when you buy it. It won’t be the car everyone, but if you can live with these limitations, you are sure to enjoy it. Indeed, all owners I have ever spoke to do love their car. I know I would if I could find space (and funds!) for one in my garage! A regular at Prescott, since it is owned by one of the location officials, is this fabulous DB4 GT. The DB4 GT was a special lightweight, high-performance version of the DB4. Introduced in September 1959, it featured enclosed headlights and a thinner aluminium skin for lighter weight. The wheelbase was also reduced in comparison to the standard car, which resulted in many cars not being fitted with rear seats. The engine was what made the GT special. Available in 3670 cc and 3750 cc versions, the engine had two sparkplugs per cylinder with two distributors and three twin-choke Weber carburettors. Modifications to the cylinder head brought compression to 9.0:1 and power output was 302 hp. Maximum speed for the GT was 151 mph with a 6.1 second sprint to 60 mph. It was the fastest road legal production car at the time. Seventy-five GTs were built with this body style. Nineteen more were modified by the Zagato works in Italy into DB4 GT Zagatos, with plain oval grilles, and a smoothed out rear end without the stock GT’s tail fins. A single car was styled by Bertone and dubbed the Bertone Jet. This diminutive car is a Seven Ulster, a sporting example of Herbert Austin’s masterpiece which did much to put Britain on wheels in the 1920s. The first Sevens were built in 1922, and were four seat open tourers. Nicknamed Chummy, the first 100 featured a 696cc four cylinder engine, which was quickly upgraded to the 747cc unit that remained until the end of production some 17 years later. The first cars had an upright edge to the doors and a sloping windscreen, but from 1924, the screen became upright and there was a sloping edge to the doors, as well as a slightly longer body. Stronger brakes came along in 1926, along with a slightly taller nickel-plated radiator grille, conventional coil ignition, a more spacious body and wider doors. An even longer and wider body arrived in 1930, as well as a stronger crankshaft and improvements to the brakes which coupled front and rear systems together so they both worked by the footbrake. In 1931 the body was restyled , with a thin ribbon-style radiator and by 1932 there was a four speed gearbox to replace the earlier three-speeder. 1933 saw the introduction of the Ruby, a car that looked more modern with its cowled radiator. There were also Pearl and Opal versions. Development continued, so in 1937 there was a move to crankshaft shell bearings in place of the white metal previously used, and the Big Seven appeared. The last Seven was made in 1939, by which time 290,000 had been produced. Aside from saloons and tourers, there had been vans and sports derivatives like the Le Mans, the supercharged Ulster and the rather cheaper Nippy. Around 11,000 Sevens survive today. There were plenty of classic Bugatti car here. This is, after all, the home of the Bugatti Owners club. Among there were a couple of Type 37s. Sharing the same body as was used on the Type 35, The Type 35 chassis and body were reused for the Type 37, which was fitted with a new 1496 cc straight-4 engine, This engine was an SOHC 3-valve design and produced 60 hp The same engine went on to be used in the Type 40. A total of 290 Type 37s were built. Also here was the Type 40, introduced in 1926 and produced through 1930, used the 3-valve 1496 cc engine first used in some Type 37s. It was an enclosed tourer or (as the Type 40A) small roadster. About 830 were built. The Type 40A shared its block with the Type 40 and displaced 1627 cc. All 40 Type 40As were built in 1930. Other models included a Type 51 replica and a Brescia Type 23. Well hidden in the car park was this facelifted Uno 45 model. These days, you are more likely to see one of the surviving Turbo models, as, like so many cars it is the performance versions that have survived in far greater quantity than the versions that were actually produced in ,much greater volumes when new. Fiat launched the Uno, the Tipo 146, in January 1983, just one day before the equally iconic Peugeot 205, to replace the elderly Fiat 127. Both were huge sellers, and deservedly so too, but it was the Fiat that sold in greater quantity, with over 8 million examples produced. It was Italy’s best selling car, and by some margin, throughout its 10 year production life, though you might find that hard to believe now, as they were are not a common sight even in Italy. The 127 had revolutionised the supermini market on its launch more than 10 years earlier, and the Uno followed the same format, but brought uptodate. Designed by Giorgetto Giugiaro’s ItalDesign company, its tall, square body utilising a Kamm tail achieved a low drag coefficient of 0.34 won it much praise for interior space and fuel economy as well as its excellent ride and handling, and was widely regarded as the most innovative small car in Europe at the time of its launch. It incorporated many packaging lessons learnt from Giugiaro’s 1978 Lancia Megagamma concept car (the first modern people carrier / MPV / mini-van) but miniaturised. Its tall car / high seating packaging is imitated by every small car today. It reversed the trend for lower and lower built cars. It showed that not just low sleek cars could be aerodynamic, but small, roomy, boxy well packaged cars could be too. There was a lot of activity in the supermini class in 1983, as the Uno hit the UK market a couple of months before the Peugeot 205 – another small European car which became the benchmark for this market sector, enjoying a long production life and strong sales, and just after General Motors launched its new Opel Corsa/Vauxhall Nova. Within a few months of its launch it had gained two new major competitors in the shape of the restyled Ford Fiesta and Nissan’s new Micra. UK sales began in June 1983, and more than 20,000 were sold in its first full year and peaking at more than 40,000 sales in 1988, making it one of the UK’s most popular imported cars during the 1980s. In December 1983, it was European Car of the Year for 1984, finishing narrowly ahead of the Peugeot 205. Initially, the Uno was offered with the 903 cc 100-series OHV, 1.1 litre (1116 cc) and 1.3 litre (1301 cc) 128-series SOHC petrol engines and transmissions carried over from the 127. The Uno’s badging was not by the commonly used measurement of engine size but by metric horsepower: 45, 55, 60, 70, or 75. The Uno was available as either a three- or five-door hatchback. It also featured ergonomic “pod” switchgear clusters each side of the main instrument binnacle, (that could be operated without removing the driver’s hands from the steering wheel), although indicators remained on a stalk; an unusual arrangement similar to that used by Citroën. The Uno had MacPherson strut independent front suspension and twist-beam rear suspension with telescopic dampers and coil springs. From 1985, the 1.0 litre (999 cc) SOHC Fully Integrated Robotised Engine (FIRE) powerplant was offered, replacing the 0.9 litre unit. This was a lighter engine, built with fewer parts, and gave improved performance and economy. The most luxurious version, the single-point injected 75 SX i.e., had remote door locks, integrated front foglamps, and the oval exhaust tip also used on the Turbo. In April 1985 the hot hatch version of the first series Uno – the Uno Turbo i.e. – was launched as a three-door only derivative. It competed with the likes of the Ford Fiesta XR2, MG Metro Turbo and Peugeot 205 GTI. The Uno was replaced by the Punto in late 1993, although production for some markets continued for some time after that. Representing the “Big Cat”, was this S Type. Having made 2 significant new car launches in 1961 at the top of the range, with the gargantuan Mark X and the E Type, for their next new model, Jaguar turned their attention lower down, believing that the Mark 2, based on design which had first launched in 1955 would need updating to keep it competitive. Sir William Lyons believed that the car would need to adopt some of the innovations that had been seen on the Mark X and the E Type, such as Jaguar’s new independent rear suspension and the triple SU carburettor version of the 3.8-litre XK engine Accordingly work started on a call which was codenamed “Utah Mk III”, (the Mark 2 having been “Utah Mk II”) and which made its public debut as the S Type. Both time and budget were limited, so rather than being an all new car, the S Type was a major redevelopment of the Mark 2. It used a mid-scale version of the Mark X independent rear suspension to replace the Mark 2’s live rear axle and featured revised styling, with the changes more obvious at the back with a longer tail giving more boot space. rear bodywork, with only minor changes to the front and a slightly flattened roofline, which is one reason why a lot of people have trouble distinguishing the car from its smaller brother. A more luxurious interior was fitted, with greater use of burr walnut and leather than was to be found in the Mark 2. The S Type was available with either 3.4 or 3.8-litre XK engines but only in twin carburettor form because the triple carburettor set-up would not fit into what was essentially still the Mark 2 engine bay. By the time of the S Type’s release in 1963, the Mark 2 was still selling strongly, despite its age, whereas the Mark X was selling less well than had been hoped, especially in its intended market of the USA, so Sir William decided to retain all three models in the Jaguar range concurrently. Sales of the S Type were relatively modest throughout its 6 year production life, with 9928 of the 3.4 litre and 15.065 of the 3.8 litre cars made. Looking rather imposing in its bright copper-coloured paintwork was this Range Rover SVR, the stupendously fast model in the range which was conceived to compete with the AMG Mercedes and other uber-rapid SUVs. Somehow, I failed to take any pictures of my own car – ashamed by the layer of grime that was on it! – which means that the only other Maserati here was a 4200 Coupe. After producing BiTurbo based cars for 17 years, Maserati replaced their entire range with a new model in July 1998, the 3200 GT. This very elegant 2+2 grand tourer was styled by Italdesign, whose founder and head Giorgetto Giugiaro had previously designed, among others, the Ghibli, Bora and Merak. The interior design was commissioned to Enrico Fumia. Its name honoured the Maserati 3500 GT, the Trident’s first series production grand tourer. Sold mainly in Europe, the 3200 GT was powered by the twin-turbo, 32-valve, dual overhead cam 3.2-litre V8 engine featured in the Quattroporte Evoluzione, set up to develop 370 PS (365 hp). The car was praised for its styling, with the distinctive array of tail-lights, consisting of LEDs, arranged in the shape of boomerang being particularly worthy of comment. The outer layer of the ‘boomerang’ provided the brake light, with the inner layer providing the directional indicator. The car was also reviewed quite well by the press when they got to drive it in early 1999, though it was clear that they expected more power and excitement. That came after 4,795 cars had been produced, in 2001, with the launch of the 4200 models. Officially called the Coupé and joined by an open-topped Spyder (Tipo M138 in Maserati speak), these models had larger 4.2 litre engines and had been engineered so the cars could be sold in America, marking the return to that market for Maserati after an 11 year gap. There were some detailed styling changes, most notable of which were the replacement of the boomerang rear lights with conventional rectangular units. Few felt that this was an improvement. The cars proved popular, though, selling strongly up until 2007 when they were replaced by the next generation of Maserati. Minor changes were made to the model during its six year production, but more significant was the launch at the 2004 Geneva Show of the GranSport which sported aerodynamic body cladding, a chrome mesh grille, carbon fibre interior trim, and special 19-inch wheels. It used the Skyhook active suspension, with a 0.4 inch lower ride height, and the Cambiocorsa transmission recalibrated for quicker shifts. The exhaust was specially tuned to “growl” on start-up and full throttle. The GranSport was powered by the same 4244 cc, 90° V8 petrol engine used on the Coupé and Spyder, but developing 400 PS (395 hp) at 7000 rpm due primarily to a different exhaust system and improvements on the intake manifolds and valve seats. A six-speed paddle shift transmission came as standard. The GranSport has a claimed top speed of 180 mph (290 km/h) and a 0–62 mph (0–100 km/h) time of 4.8 seconds. Needing no introduction is the Issigonis Mini,, of which this is an early example. One of the people who joined me for the day is the lucky owner of a blue Cayman GT4, and I took advantage of a few minutes whilst we waited for a third friend to arrive, at our rendezvous point, the Shutters Inn, in Gotherington, to grab some photos before we headed up to Prescott in convoy. I was quite surprised when, on getting out of my car, I spotted a blue Cayman GT4 up in the trees, some way from where I had just parked, and assumed that Dan had somehow been directed up to this part of the Orchard., But no, it turned out that this was a second example of the model, and in one of those slightly spooky coincidences, it happened to be the same colour! The Cayman GT4, much rumoured for some time, was officially launched at the 2015 Geneva Show, positioned to sit between the Cayman GTS and the 911 GT3. By the time of the official unveiling, the car was supposedly sold out many times over, though more recently it has become apparent that at least some Porsche dealers have been holding onto cars claiming that the first purchaser changed their mind, and then offering them to those who did not get one of the allocation a year ago, at vastly inflated prices. If true, this is very sharp practice indeed, but seems to be the sort to tricks that are becoming increasingly common as enthusiasts are being fleeced in the name of extra profit. For a starting price of around £65,000 in the UK, the lucky customer would get a car which used used a stiffened and strengthened Cayman bodyshell as a starting point, but lowered by 30mm . Porsche say that in fitting as many GT parts as possible, they did not make it out of a Cayman GTS, but rather they produced an entry-level mid-engined GT3 car. That sounds like PR spin to me, as of course the car does use an awful lot of parts from the regular Cayman. However, plenty is changed, too. There is a reworked version of the Carrera S’s 3.8-litre flat six engine, producing 380bhp at 7400rpm and 310lb ft at 4750-6000rpm, hooked up to a modified version of the Cayman GTS’s six-speed manual gearbox. A PDK dual-clutch automatic was considered but rejected, meaning the Cayman GT4 is manual only. This is enough to mean that the 0-62mph sprint takes 4.4sec and the top speed is 183mph, with combined fuel economy of 27.4mpg and CO2 emissions rated at 238g/km. The front axle and suspension are borrowed from the 911 GT3 and the rear axle and forged aluminium double wishbone suspension are completely new. Dampers are taken from the 911 GT3. The electric steering system from the 911 GT3 does make it onto the Cayman GT4 but is given new software. Stopping power is provided by standard steel brakes, or optional carbon-ceramics from the 911 GT3. The forged 20in alloy wheels were new and are shod with Michelin Pilot Sport Cup 2 tyres. The rear 295/30 ZR20 tyres are bespoke, but the front 245/35 ZR20s were borrowed from the 911 GT3 as they were “a perfect match”. design-wise, the goal was to create a “zero lift car”, but thanks to the extensive aerodynamic and cooling package on the car – which includes a front splitter, a larger front grille and increased frontal air intakes, side air intakes, not one but two rear spoilers and a fully functional diffuser – the Cayman GT4 produces as much downforce at speed (100kg) as the 911 GT3. Every single part on the Cayman GT4 has a functional use. Other design features include “cool” black glass on the front and rear lights, blackened twin central exhausts and quality stitching on the twin lightweight bucket seats, taken from the 918 Spyder, as small details adding to that ‘want factor’.Despite all the extra equipment, the Cayman GT4 weighs no more than a Cayman GTS, tipping the scales at 1340kg dry. You could delete items such as the sat-nav and air-con to save weight, but few customers did, just as with the 911 GT3 RS were just 2% of buyers deleted the air-con. Inside, the steering wheel was new. The sports seats were trimmed in both leather and Alcantara. Standard equipment included bi-xenon headlights, a sports exhaust system, a Sport Chrono Package with dynamic engine mounts, the Porsche Torque Vectoring system, a mechanical limited-slip differential at the rear and the Porsche Stability Management system. On the options list were items such as carbonfibre-reinforced, plastic-backed seats for the two-seat interior. These weigh just 15kg each and were inspired by the 918 Spyder. A customised version of the Sport Chrono Package was offered, as is a Club Sport Package. With production limited – each Porsche Centre in the UK was allocated just 10 cars – the car sold out long before any reviews were published, but when they came, it was quite clear that Porsche had produced an absolutely cracking car. After producing the wedge-shaped Tasmin and its family of V8 powered 350i, 390SE and 450SE models, TVR’s next car took something of a retro look, with the S Series which was announced at the 1986 British International Motor Show, initially as a concept. Due to a massive positive response, the car went into production in less than 12 months, with 250 pre-manufacture orders. This was Peter Wheeler’s first major development since buying the company from Martin Lilley, and the turning point in TVR’s fortunes, which had struggled with the “Wedge” based cars that had been introduced in 1980 to replace the long running M Series models. With styling which looked more like these popular M Series cars, the first S Series cars used Ford’s Cologne V6 in 2.8 litre 160 hp and for the later S2 to S4 had the later 2.9 litre 170 hp unit. TVR made frequent updates to the cars, moving from those retrospectively called the S1 to S2 and later S3 and S4 in short succession. The S3 and S4 received longer doors, although some late S2’s were also thus equipped. Vehicle models ending with “C” were used to denote vehicles which were fitted with a catalytic converter. Only the S3 and S4 were fitted with catalysts. The Cat was only introduced to the UK in August 1992, at “K” registration, but catalysed cars were produced before that, intended for export to markets with tighter emissions standards. Just as they had done with the “wedges”, TVR found more excitement by putting the Rover V8 engine under the bonnet of the car in lieu of the Ford unit, though the two models were offered in parallel. The V8S used a 4.0 litre fuel-injected Rover V8 engine, with gas-flowed cylinder heads, higher lift camshaft, compression ratio upped to 10:5:1, revised manifold, new chip for the engine management system and a limited slip differential. The result was 240 bhp at 5250 rpm and 270 lb/ft of torque at 3000 rpm. The V8S had a number of cosmetic differences over the V6. The bonnet had a large hump – created to house the Italian specification supercharger but carried over to all V8S models. The V8S had a small vent facing the windscreen, whereas S1 to S3 models face forward. Very late S3 and S4 models had no hump at all. As with all TVR’s there is no specific point in time when they changed styles, probably when they ran out! The suspension track was slightly wider on the V8S achieved with revised wishbones at the front and revised trailing arms at the rear. Disc brakes are fitted all round. The standard specification of the V8S included ½ hide leather interior, walnut trim, mohair hood, OZ alloy wheels, driving lamps, electric windows and door mirrors. 0-60 mph could be achieved in 4.9 seconds and 0-100 mph in 12.9 seconds. It was faster than an Aston Martin Virage, a Ferrari Testarossa, Lotus Esprit Turbo SE and Porsche Carrera 2 the supercars of the early 1990s. Between 1986 and 1994 2,604 S Series cars were made; 410 of these were of the V8S variety. The other TVR I came across was a Cerbera, a model which was first shown as a prototype at the 1994 Birmingham Show, entering production in 1996. The name derives from Cerberus the three-headed beast of Greek legend that guarded the entrance of Hades. This was the third car manufactured by TVR under the leadership of Peter Wheeler, and it represented three firsts for the Wheeler-led company: the first hard-top—the Griffith and the Chimaera were both convertibles; the first 2+2—TVRs were traditionally two-seaters; the first to be driven by TVR’s own engines—historically, TVR had purchased engines from mainstream manufacturers like Rover, Ford and Triumph. Prior to the Cerbera, TVR had purchased V8 engines from Rover and then tuned them for their own use. When Rover was purchased by BMW, Peter Wheeler did not want to risk problems should the Germans decide to stop manufacturing the engine. In response, he engaged the services of race engineer Al Melling to design a V8 engine that TVR could manufacture in-house and even potentially offer for sale to other car-makers. In an interview for the television programme Top Gear, Wheeler explained “Basically, we designed the engine as a race engine. It was my idea at the time that if we wanted to expand, we ought to make something that we could sell to other people. We’ve ended up with a 75-degree V8 with a flat-plane crank. The bottom-half of the engine to the heads is exactly as you would see in current Formula One engines.” Wheeler was quoted at the time of the car’s launch as saying that the combination of light weight and high power was too much for a road car, a quote which ensured much free publicity in the press. Enthusiasts still argue about whether this was a typical example of Wheeler’s legendary frankness, or an equally typical example of his PR chief Ben Samuelson’s knack for saving on advertising costs by creating a story. The result was dubbed the “Speed Eight” (official designation ‘AJP8’) after Al Melling, John Ravenscroft and Peter Wheeler, a 4.2 litre V8 producing 360 hp and gave the Cerbera a top speed of 185 mph (297 km/h). A 4.5 litre version of the engine was later offered with 420 hp. The AJP8 has one of the highest specific outputs of any naturally aspirated V8 in the automotive world at 83.3 hp/litre for the 4.2 and 93.3 hp/litre for the 4.5. Later models of the 4.5 litre engine had the ‘Red Rose’ option, which increased output to 440 bhp (97.7 hp/litre) when fuelled with super-unleaded (high octane) and the driver pushed the unmarked button on the dashboard which altered the engine mapping to suit. In some cases, real-world outputs for production V8s (4.5 in particular) were down from TVRs quoted output. Some of these have seen some form of modification (ECU, induction, exhaust etc.) to bring the power back up to the factory quoted output. One of the attractions of the V8 Cerberas for many owners was the loud backfire produced on overrun, particularly at low speeds. In fact this was the result of an argument at the factory between one of TVR’s executives and the engineers mapping the engine. The engineers wanted to map out this “irregularity” to improve fuel efficiency and CO2 emissions, whilst the executive insisted it was exactly the kind of thing owners would like. In the end a compromise was reached in which the popping and banging remained on the 4.5 litre cars. With the success of the Speed Eight program, Wheeler also undertook the design of a “Speed Six” engine to complement it. This engine also made its debut in the Cerbera but was a 4.0 litre inline slant six design with four valves per cylinder to the Speed Eight’s two. In service however it gained a reputation for unreliability and many engines had to be rebuilt. The car itself was designed from the start as a four-seater. The rear seats are smaller than the front, a design commonly referred to as a “2+2”. However, the interior is designed so that the passenger seat can slide farther forward than the driver’s seat. This allows more room for the person sitting behind the front passenger. TVR have referred to this as a “3+1” design. TVR maintained its tradition of building cars that were not only exceptionally powerful but also very light for their size and power output. The Cerbera’s weight was quoted by TVR at 1100 kilograms, although customers claimed the weight varied between 1,060 kg (2,337 lb) and 1,200 kg (2,646 lb). The dashboard was designed especially for the Cerbera and uses a two-spar steering wheel as opposed to the typical three-spar previously found in most TVRs. The reason for this is that minor instruments are located on a small panel below the steering wheel and a third spar in the wheel would have made them difficult to read. Like all TVRs of the Peter Wheeler era, the Cerbera had a long-travel throttle to compensate for the lack of electronic traction-control and very sharp steering. The V8 powered cars were two turns from lock to lock and the Speed Six car was 2.4 turns. This made it easier for experienced drivers to maintain or regain control of the car in the event of a loss of traction but some less experienced drivers complained that it made the cars feel “twitchy” and more responsive than they would otherwise have preferred. In 2000, TVR changed the styling of the car slightly by modifying the headlights to more closely resemble those seen in the TVR Tuscan. The “facelift” features were available with all three engine configurations. In addition, the cars equipped with the 4.5 liter engine were offered with the “lightweight” option, reducing the overall weight through the use of lighter body panels and a slightly reworked interior. The final car was made in 2006. Despite the rather soggy weather, this was a great day out, and a fitting end to a season of very enjoyable days, several of which I had been able to include in my 2017 events schedule. Such is the pressure on the diary that even in October, there are clashes, and the sad reality is that this two day event tends to clash with Castle Combe’s Autumn Festival, which was the case once again this year. It also coincides with the final Sunday Scramble at Bicester Heritage. I’d like to be able to attend them all, but that is not possible, so for 2017 I chose 1 day at Prescott and 1 at Bicester. Looking at the 2018 dates, it would seem that I will have the same hard choice to make again over the weekend of 6th and 7th October. It would be very difficult not spend at least one of those days at Prescott.